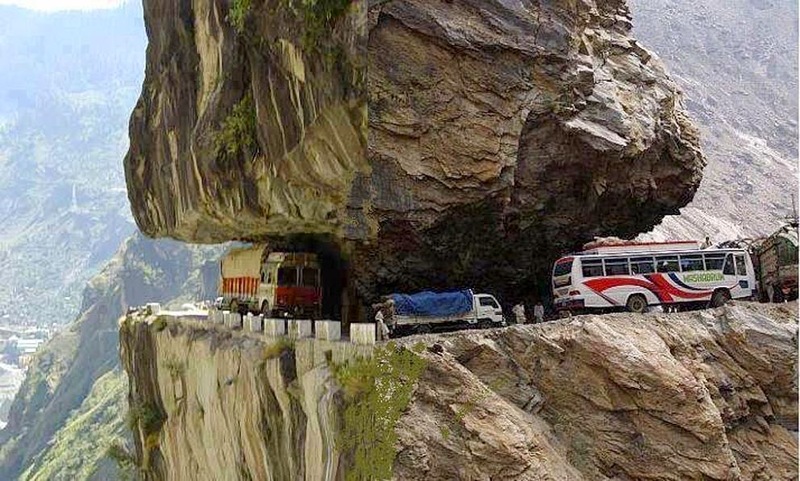 Continuation of (Guruduth Kamath & Ashok Parimoo) “Trans Himalayan Hindustan-Tibet Road” fantasy. (Day 3):--18th July 2014:--- Next day morning at Bhavnagar, after a deep sound sleep, we got up leisurely by 8 AM. All night along it had been raining continuously. After hot water bath we packed up our luggage and reloaded it into our car and then drove straight on a steep up-ward gradient road that leads straight right upto the main market of Bhavnagar, at NH-22. Here we stopped for our breakfast. We entered into a small road side tea stall called as “Krishna Tea stall” In this tea stall there were two teenage girls who were helping their father to make “Moo-mos” Guruduth clicked series of pictures of the whole process of how to make “Moo-mos”. It was interestingly fascinating to see how effortlessly and efficiently they were making these Moo-mos. At the tea stall we ordered Moo-mos, aloo parothas and hot milk for our breakfast. It was hot, tasty, refreshing and filling breakfast..
After the breakfast we rearranged the luggage of our little “PEGASUS--ALTO”, (In Greek mythology “Pegasus” is the white immortal flying horse). While we were busy reloading our car, most of the Locals, out of sheer curiosity inquired from us, where were we heading to? As we told them that we were going to Leh-Ladakh via NH-22. In disbelief their mouths opened wide and their heads shook repeatedly, in negative gesture saying “Oh No”, not possible? Then they warned us about the seriousness of the condition of the treacherous road ahead of us. 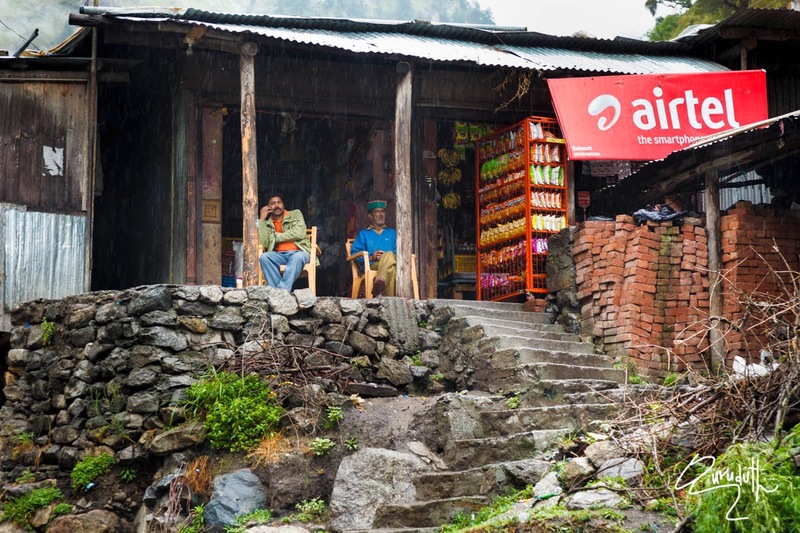 It was not only the tough deplorable road condition, but it was also that the clearance in between the low-chassis of our Alto car and the deplorable road was a very serious concern and was also a very serious problem. 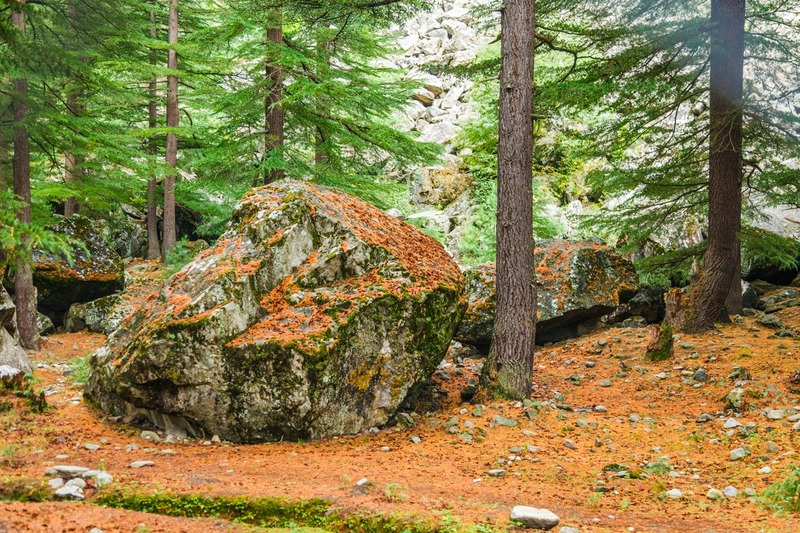 All of them advised us that because of the low clearance of the car and big boulders on the road ahead, our car would definitely break down somewhere on the way. 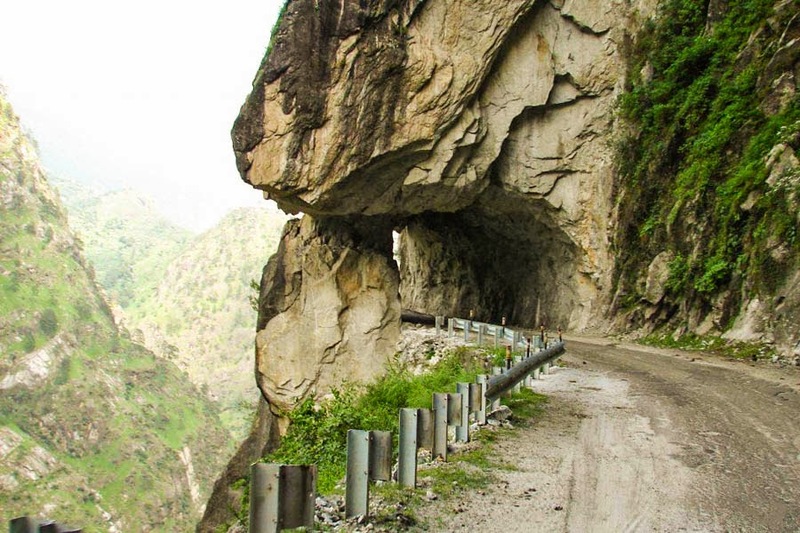 Most of them suggested us that it was wise we turned around and went back via Kullu, Manali, Rohtang, Leh Road. After paying little heeds to their sincere advise, like big fools, we decided to continue driving on NH-22 itself. Though it was still foggy and raining, but we had not choice other than just continue driving up on our further journey. Our today’s further journey would be from Bhavnagar till Sangla village. Today’s night we would be staying at Sangla village. 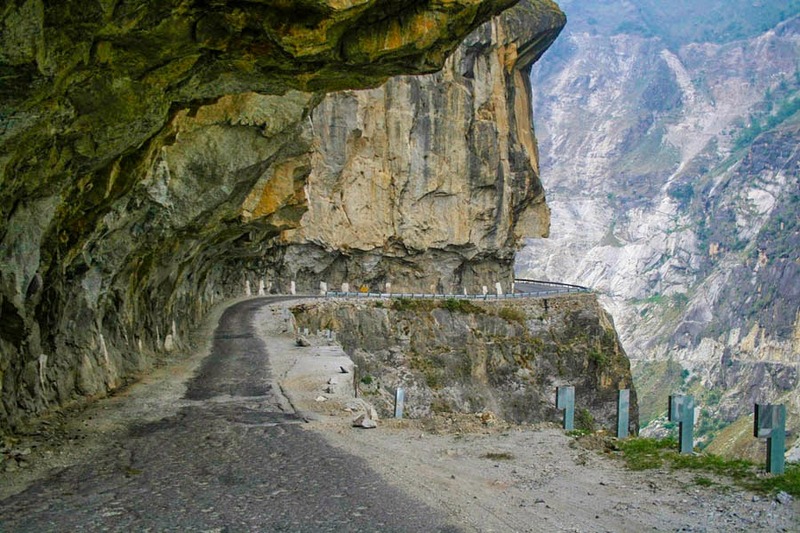 Kinnaur District is the one region of Himachal Pradesh, which faces one of the most dreadful torrential rains. 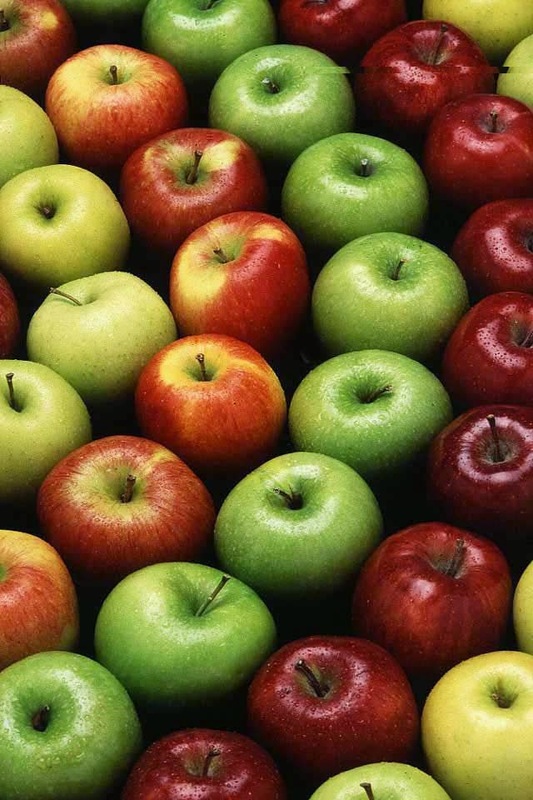 And the main cash crop of the whole district is “Apples”. 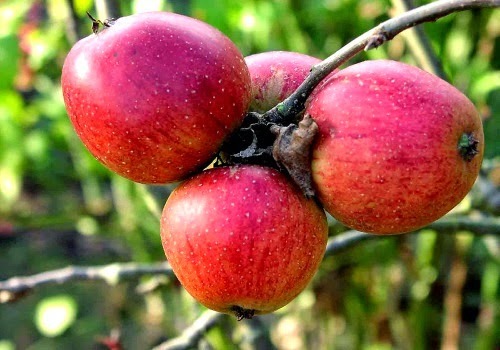 Because of the sweetness, crispness and the juiciness “Kinnauri Apples” fetch three times more cash than the apples from the rest of Haimach Paradesh. He was an American who settled in India and later participated in the Indian Independence Movement. 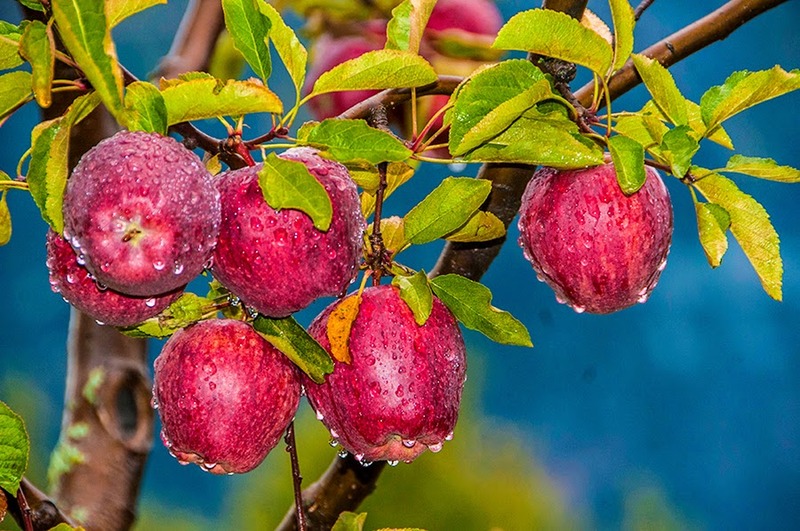 He is best remembered today for having introduced to the Indian state of Himachal Pradesh, where apples are today the major horticultural export crop. 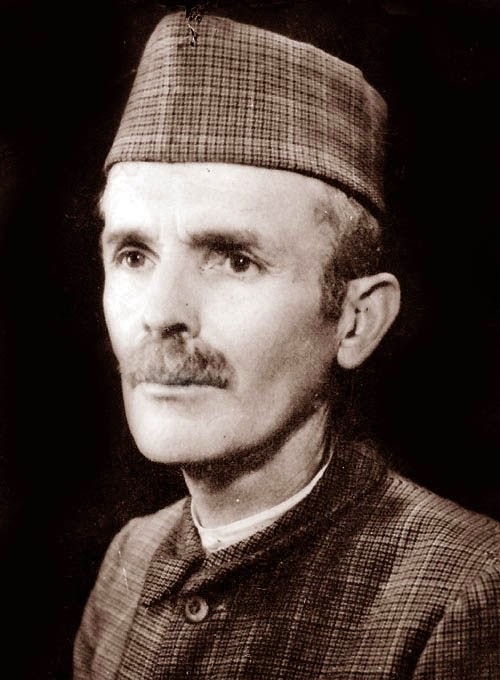 In 1904, aged 22, Samuel came to India to work at a Leper colony located at “subathu” in Shimla. In 1912, Samuel married a local “Anglo-Indian” Rajput girl, purchased a chunk of farmland near his wife's village and settled there. His wife, Agnes, was the daughter of a first generation Rajput Christian. 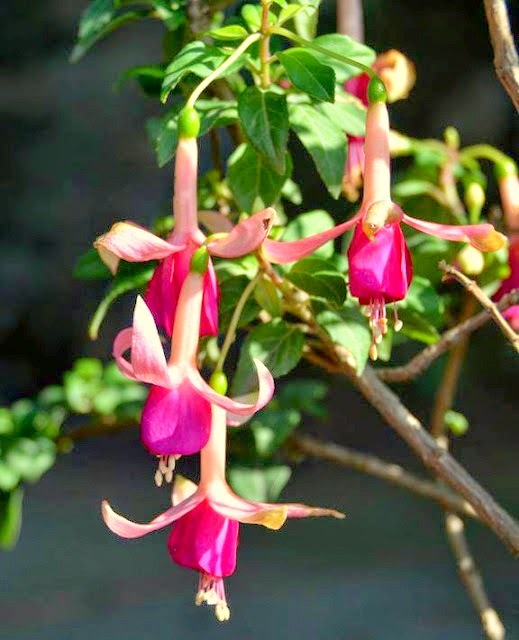 Samuel's father had settled a considerable fortune upon Samuel, and the purchasing power of this inheritance was magnified manifold in the remote, beautiful part of India where he settled. 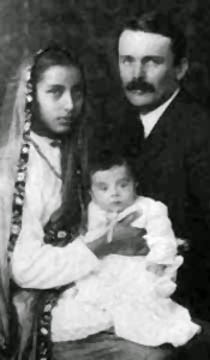 Samuel and Wife Agnes with the First Born.The family grew with the birth of five children. 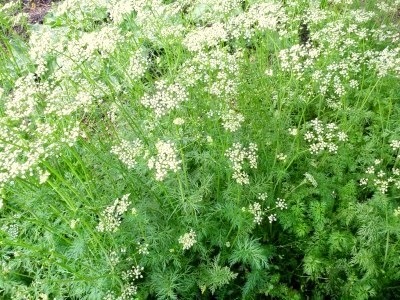 Samuel applied himself to improving the farmland he had purchased and was able to access scholarly resources unknown to the other villagers in this endeavor. 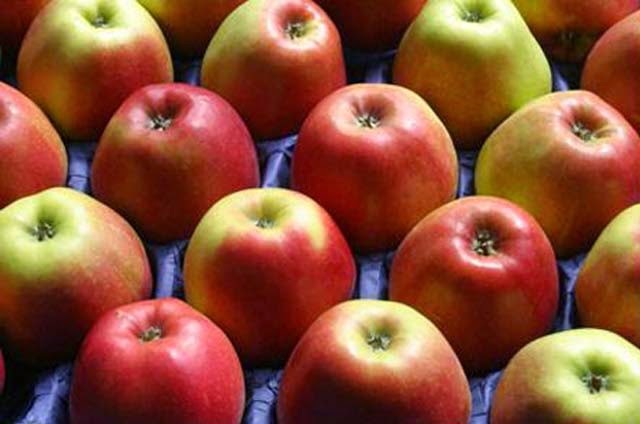 identified a new strain of apples developed by the Stark brothers of “Louisiana”, USA as being suitable to the “Shimla Hills” and began cultivating them on his farm. This was in the year 1916. 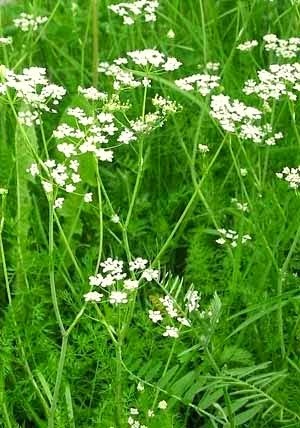 The resulting bumper crops, coupled with Samuel's access to the white people who ran the export business in Delhi encouraged the other farmers also to do as Samuel was doing, and he helped them wholeheartedly in every way. 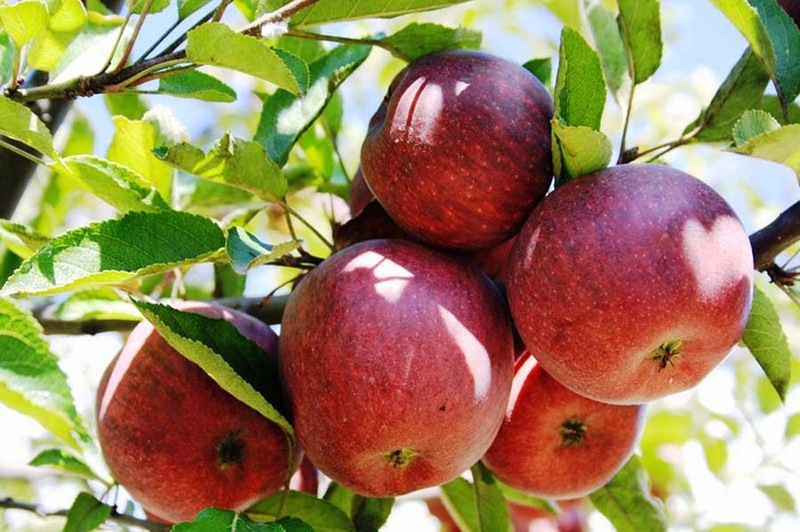 Indeed, he purchased more land and devoted it to growing apple cultivars which the villagers would use to seed their own farms. The local economy was vastly reinvigorating. After Hinduism the couple was called as "Satyananda" and "Priyadevi". 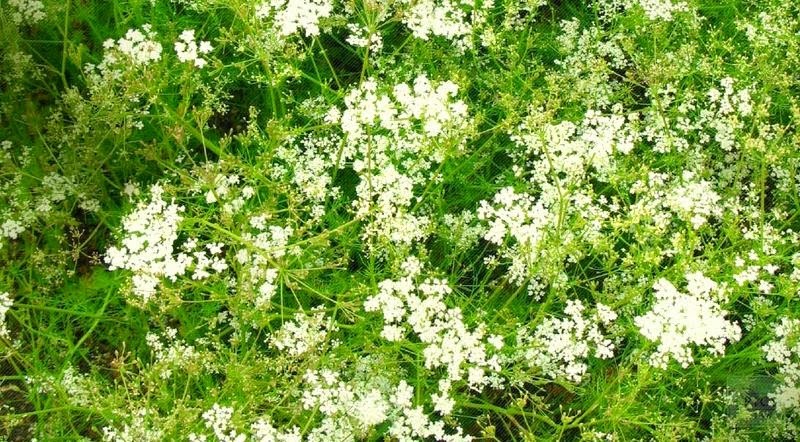 This happy idyll was shattered with the loss of his son Tara to amoebic dysentery. 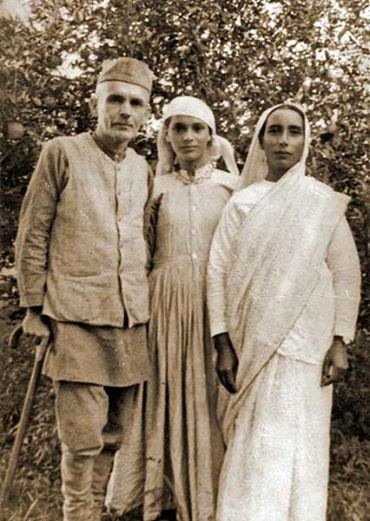 He moved closer to Hinduism and a few years later in 1932 he converted to Hinduism, taking the name "Satyananda" while his wife Agnes also changed her name to "Priyadevi". 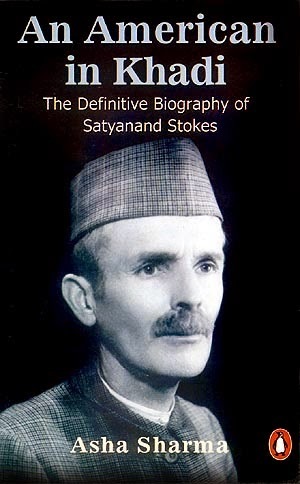 Stokes had always had a strong sense of social justice and later became active in India's freedom struggle for independence from Great Britain. Stokes had the rare honour of being the only American to become a member of the All India Congress Committee (AICC) of the Indian National Congress. Along with “Lala Lajpat Rai”, he represented Punjab. He was the only non-Indian to sign the Congress manifesto in 1921, calling upon Indians to quit government service. 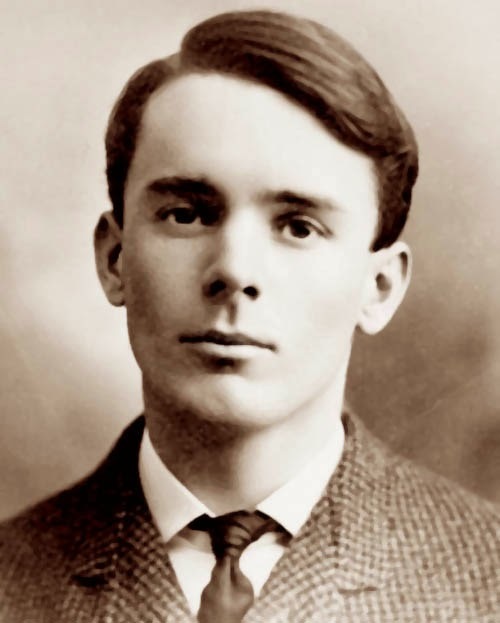 He was jailed for sedition and promoting hatred against the British government in 1921, becoming the only American to become a political prisoner of Great Britain in the freedom struggle. On Stokes’ arrest, Mahatma Gandhi wrote: “That he (Stokes) should feel with and like an Indian, share his sorrows and throw himself into the struggle, has proved too much for the government. To leave him free to criticise the government was intolerable, so his white skin has proved no protection for him. He died on 14 May 1946 after an extended illness shortly before Indian Independence. 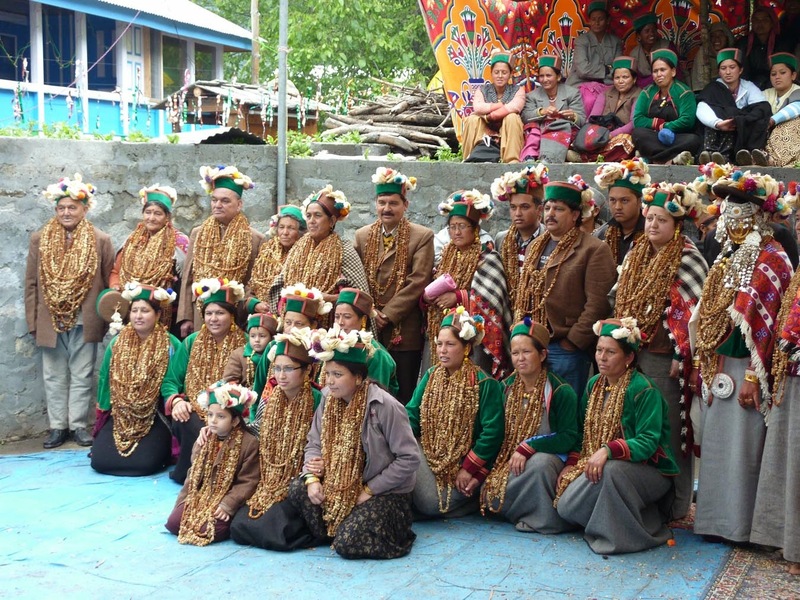 It’s just a brief introduction of Kinnaur district, about its important towns, culture, people, religion, their heritage, customs, traditions, and the life styles of its people. 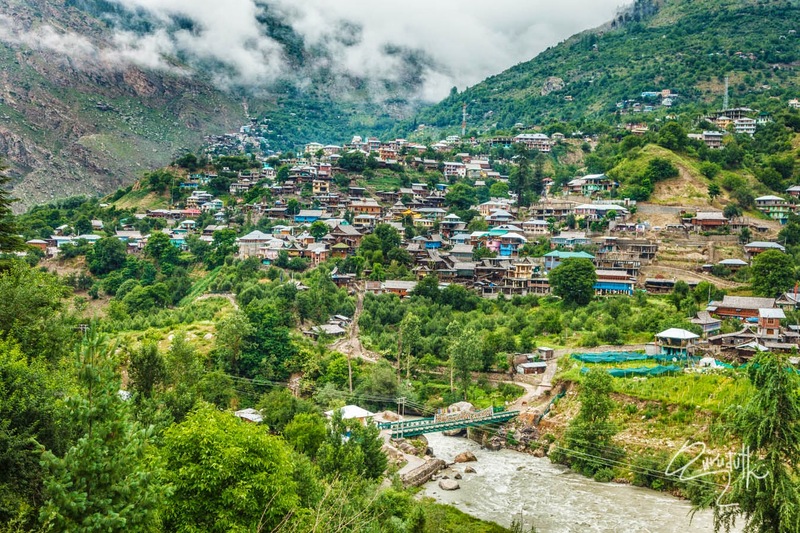 Important towns of Kinnaur district are Nichar, Sangala Valley, Kamru, Chitkul, Powari, Recong Poe (District Headquarter), Moorang, Pooh, Nako, Changho and Leo. 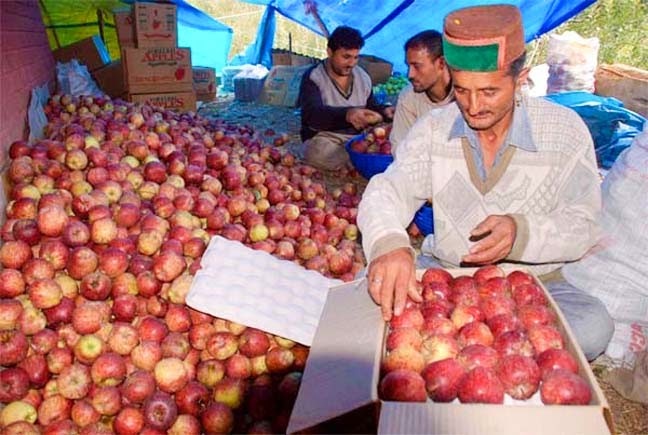 Kinnaur district produces of the finest qualities of apples which fetch three times more price compared to the rest of Himachal Apples. 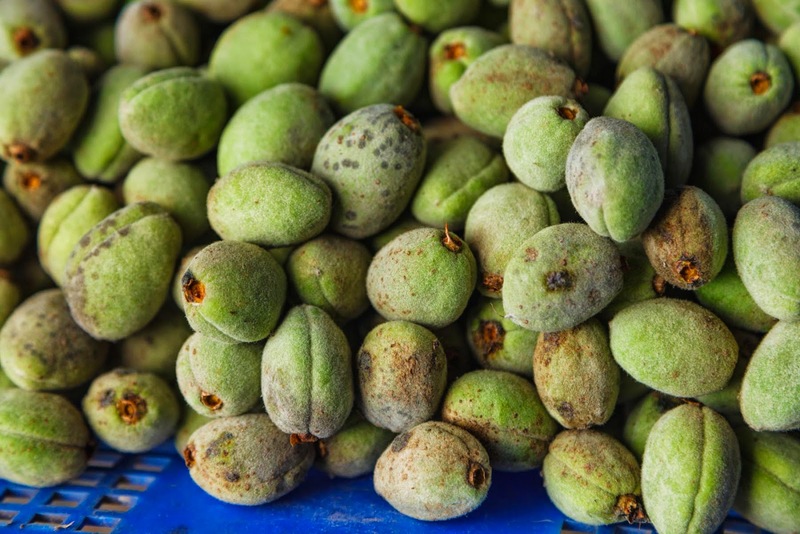 Other fruits produce in this district are almonds, dried apricots, locally called as (Chulis), grapes, raisins, chilgoza (Chestnut), grapes, beans, Jeera (spice) and Saffron. 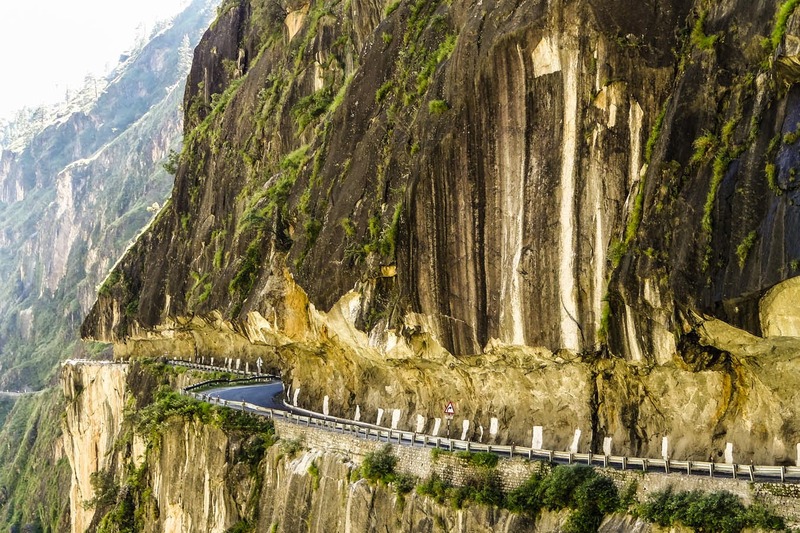 Kinnaur, surrounded by the Tibet to the east, is in the northeast corner of Himachal Pradesh, about 235 km (146 mi) from the state capital, Shimla. 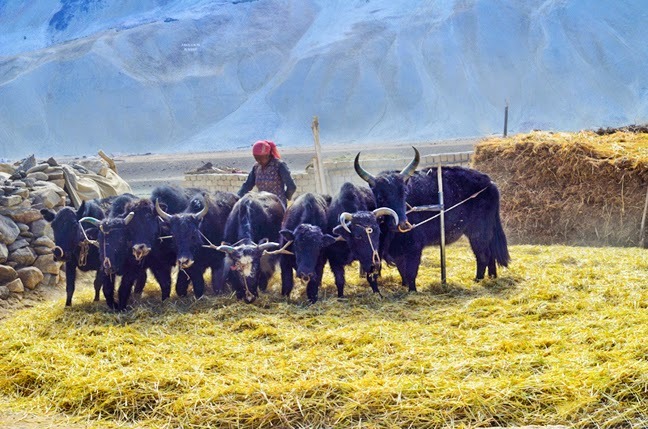 It has three high mountains ranges, namely, Zanskar, Himalayas and Dhauladhar that enclose valleys of Sutlej, Spiti, Baspa and their tributaries. 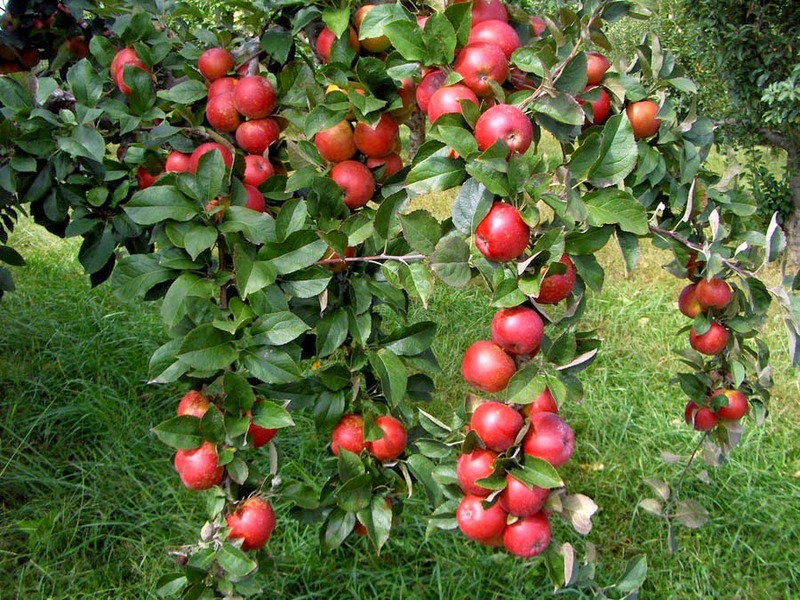 The slopes are covered with thick wood, orchards, fields and picturesque hamlets. 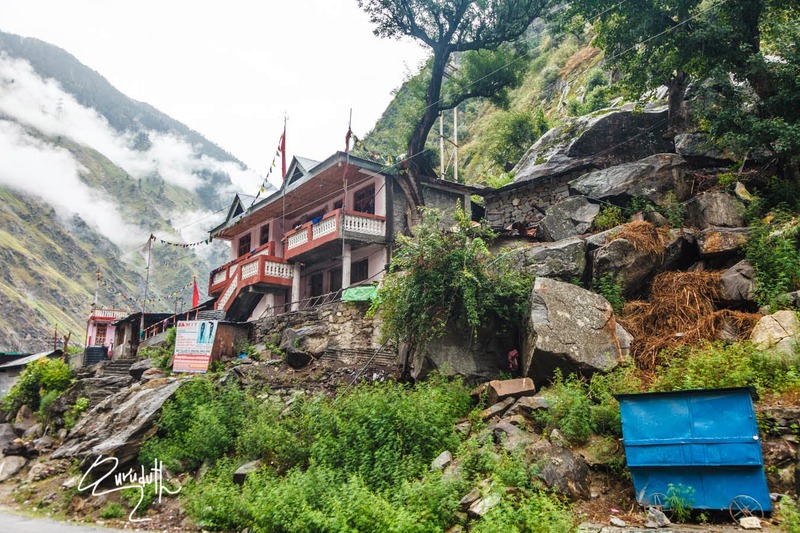 The much religious Shivling lies at the peak of Kinnaur Kailash mountain. The district was opened for the outsiders in 1889. 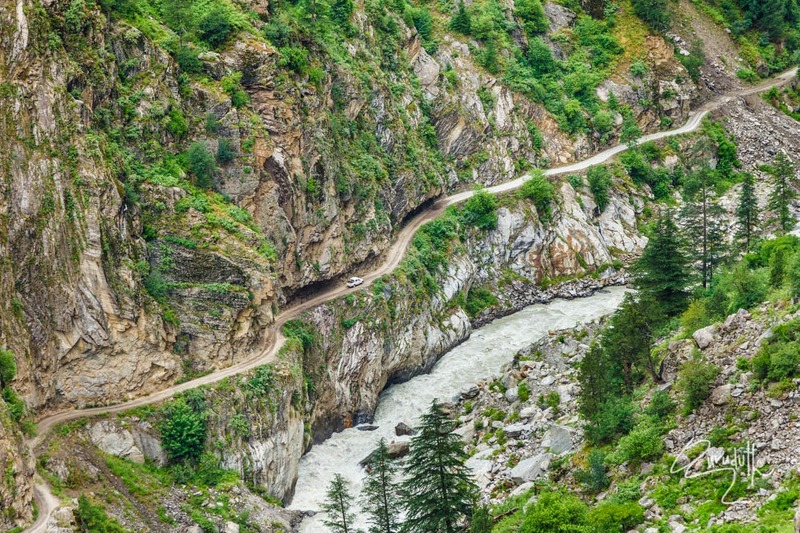 The old Hindustan-Tibet Road passes through the Kinnaur valley along the bank of river Sutlej and finally enters Tibet at Shipki La pass. 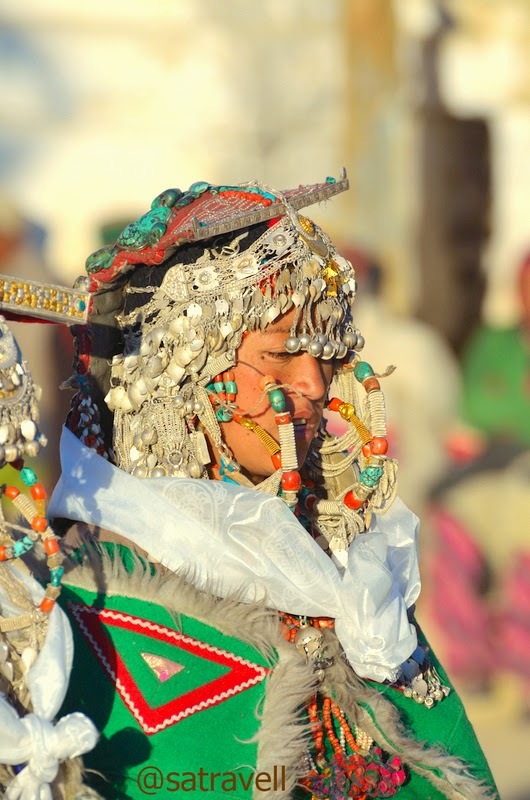 It is not only the scenic beauty which appeals to the young and old alike but also the life styles of the people, their culture, heritage, customs and traditions. 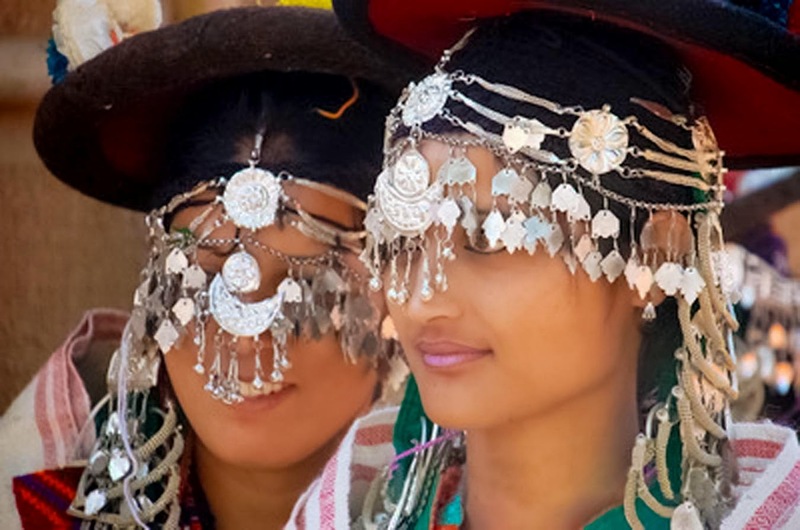 The people have strong culture and beliefs, generally follow Buddhism and Hinduism, believing the Pandavas came and resided in the land while in the exile<kamru village. 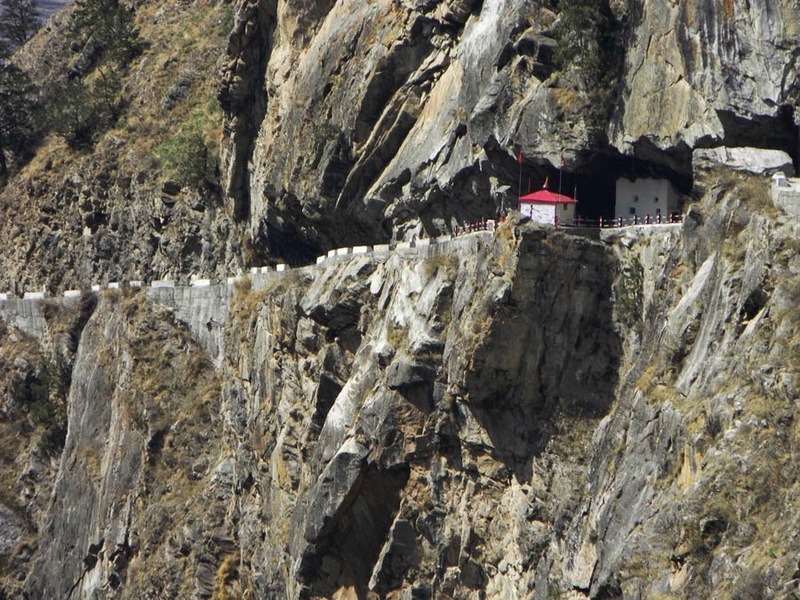 Thousands-year-old monasteries still exist in the area. 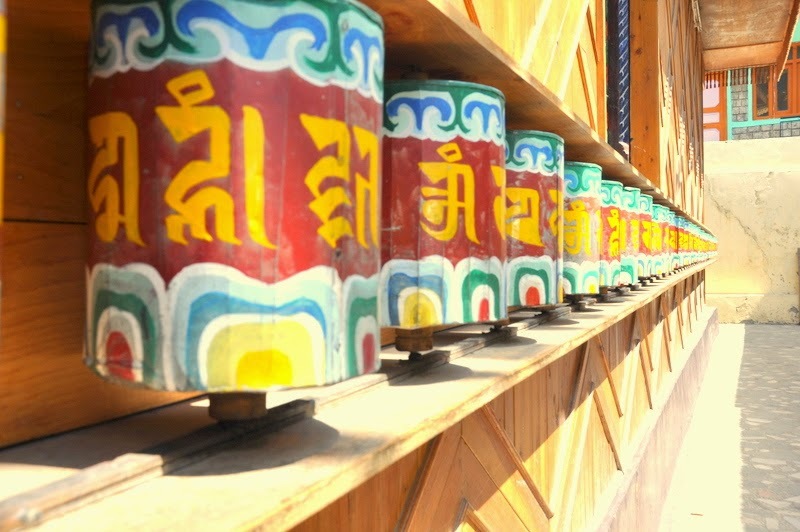 Buddhists and Hindus live in harmony symbolising the traditional brotherhood and friendship of the people of both the faiths. 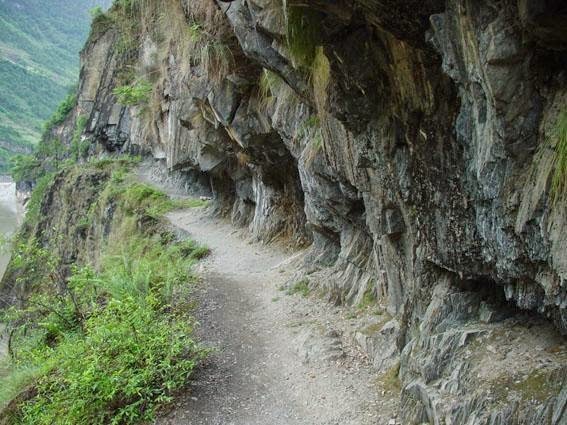 The high terrain here facilitates adventures and sports. 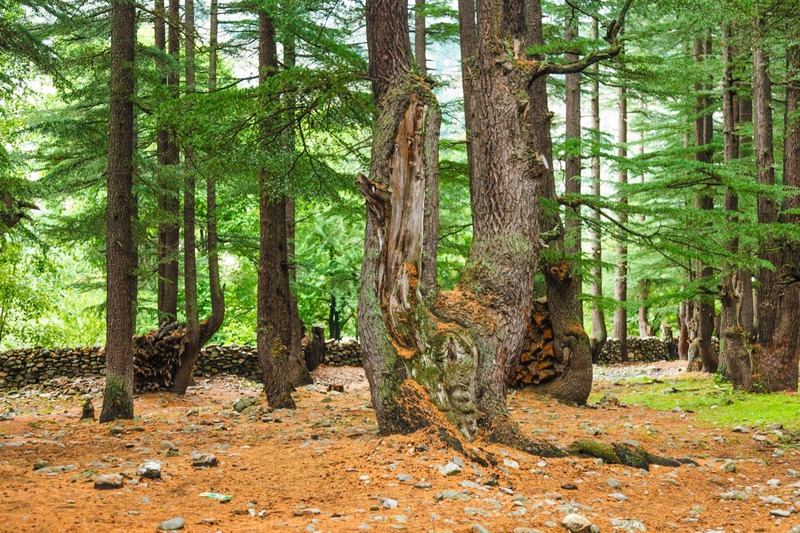 Trekking routes include the 'Parikarma of Kinnaur Kailash'. 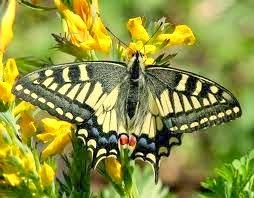 The present day Kinnauras do not constitute a homogeneous group and display significant territorial and ethnic diversity. 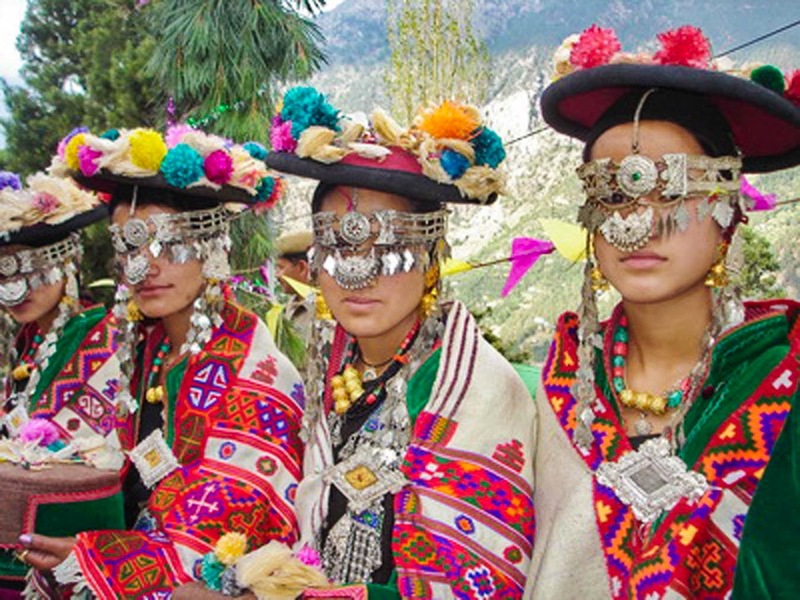 For a better understanding of ethnic and cultural distribution, Kinnaur district may be classified into three territorial units. 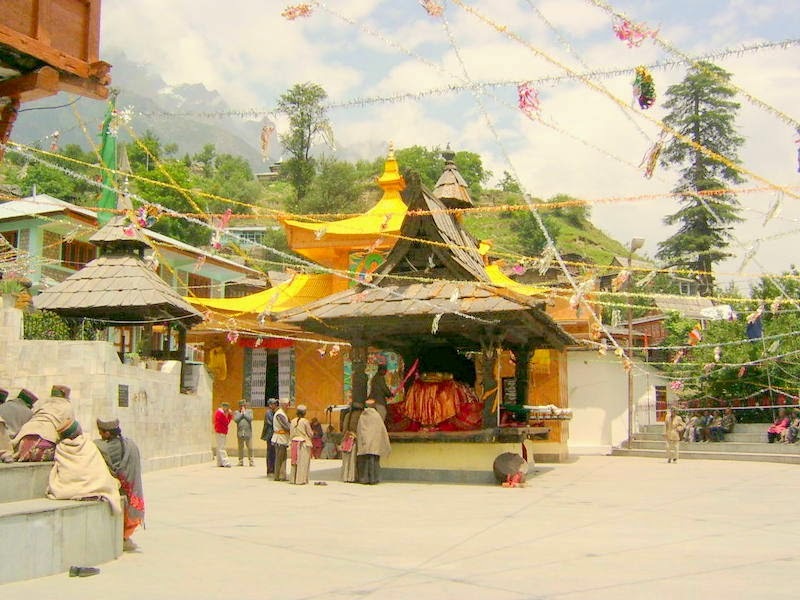 Lower Kinnaur comprise area between Chora at the boundary of the Kinnaur district with Rampur Bushahr and Kalpa including Nichar and Sangla valleys. 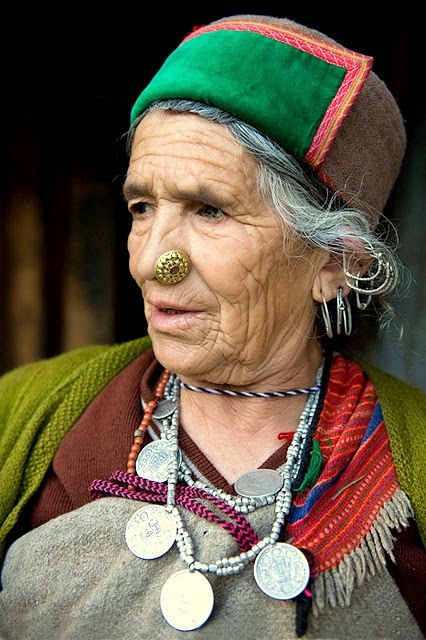 The people of Lower Kinnaur are primarily of the Mediterranean physical type. 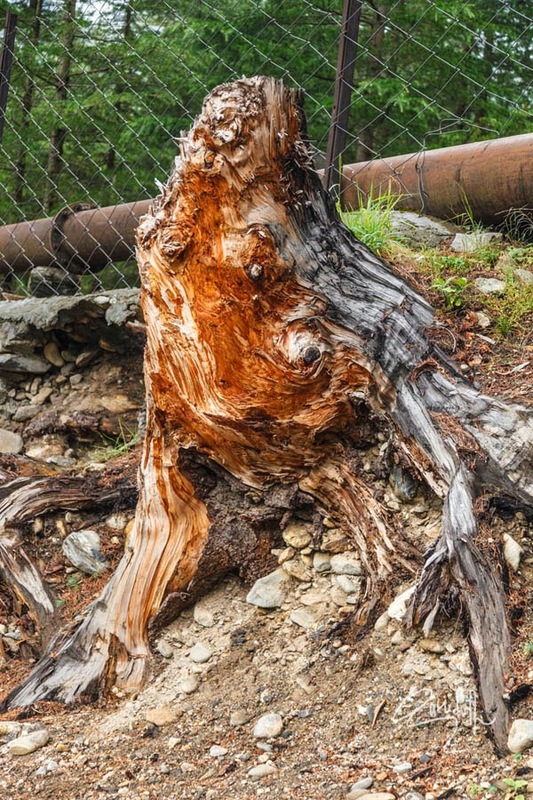 It is difficult to distinguish them from the people residing in the adjoining Shimla district with whom they have some affinity. 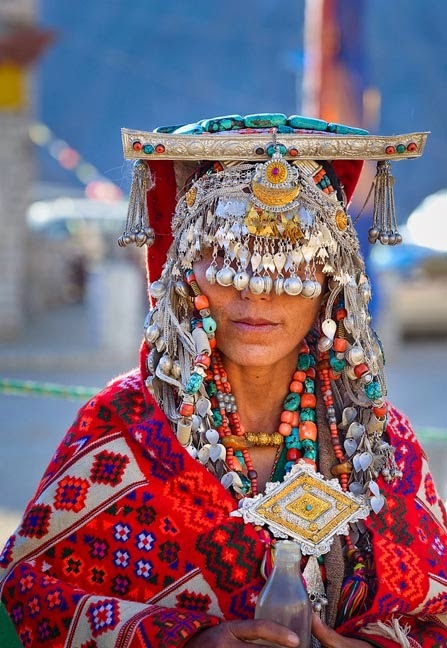 The people of lower Kinnaur are mostly Hindus though the ethno-historical factors have resulted in growing Buddhist influence. 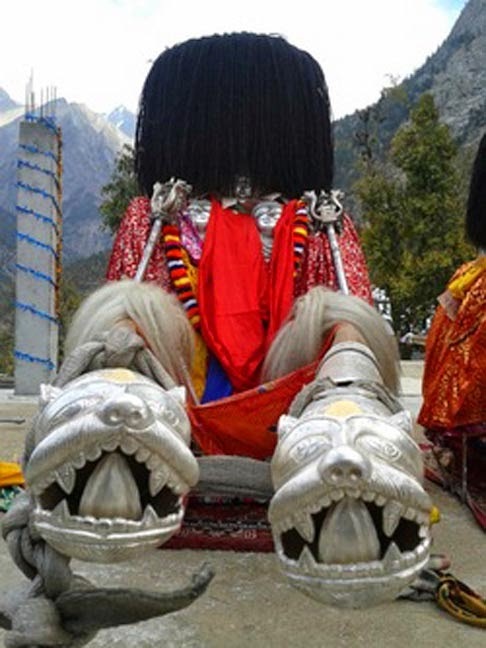 The middle Kinnaur is the area between Kalpa and Kanam including Moorang tehsil. 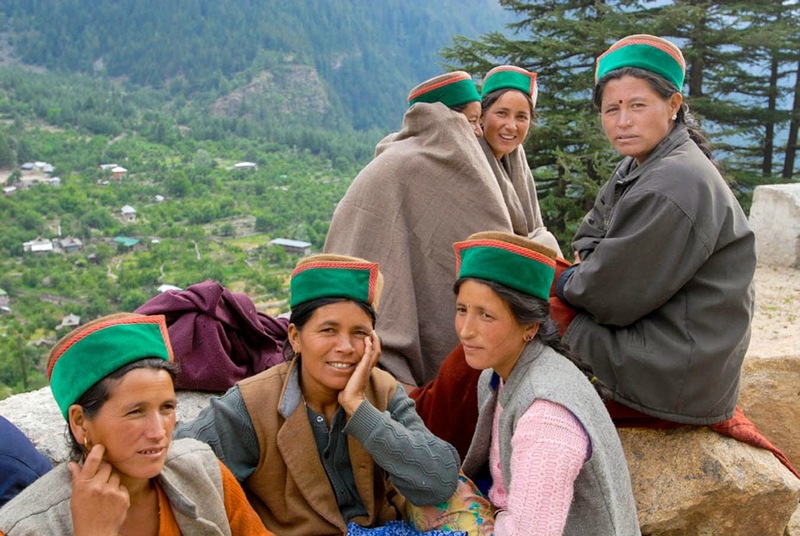 The people of middle Kinnaur are of mixed racial strain. Some have marked Mongoloid and others marked Mediterranean features. 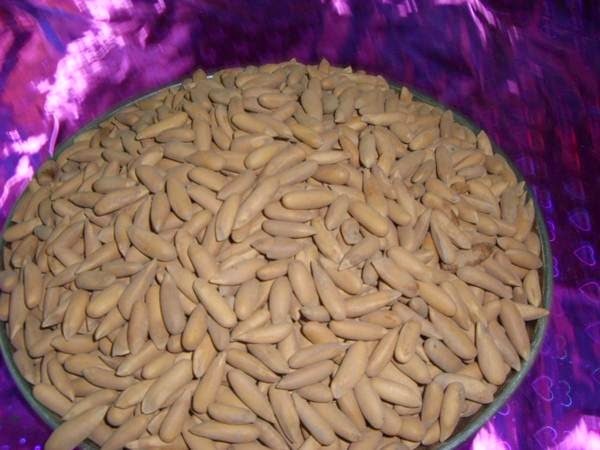 In some cases there is an admixture of the above two in varying degrees. 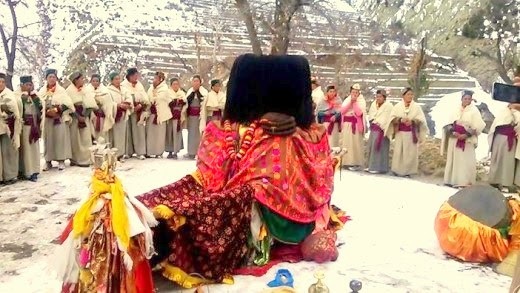 The inhabitants are Buddhist as well as Hindus. Many people have faith in both the religions. 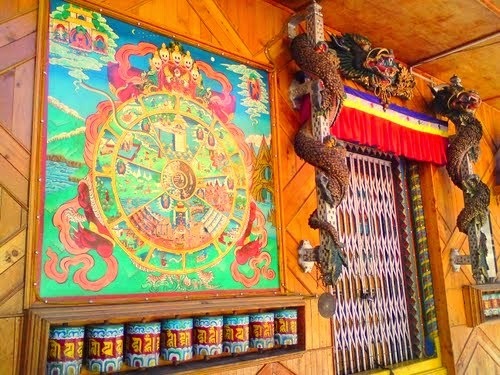 It is very common to see Buddhist flag in most houses. 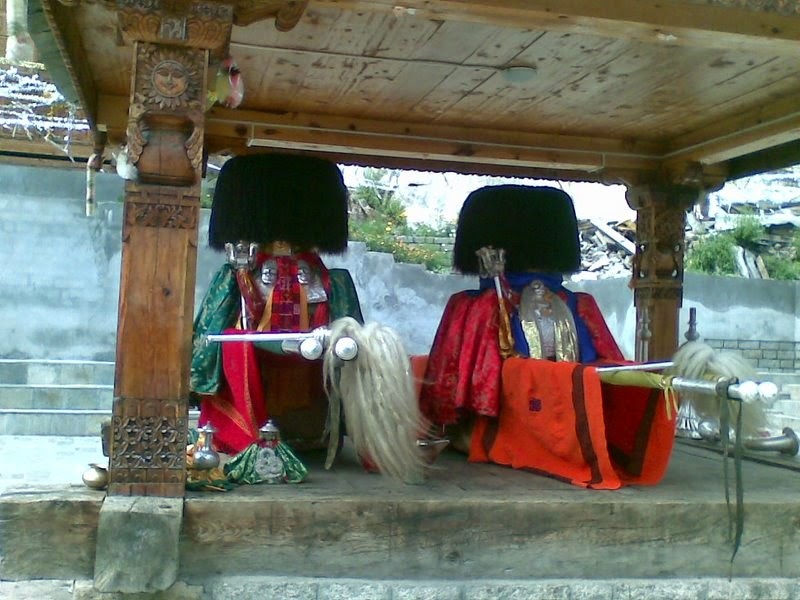 The upper Kinnaur comprises remaining north-eastern part of the district i.e. the area between Poo (Town) and Hangrang valley extending up to international border with Tibet. 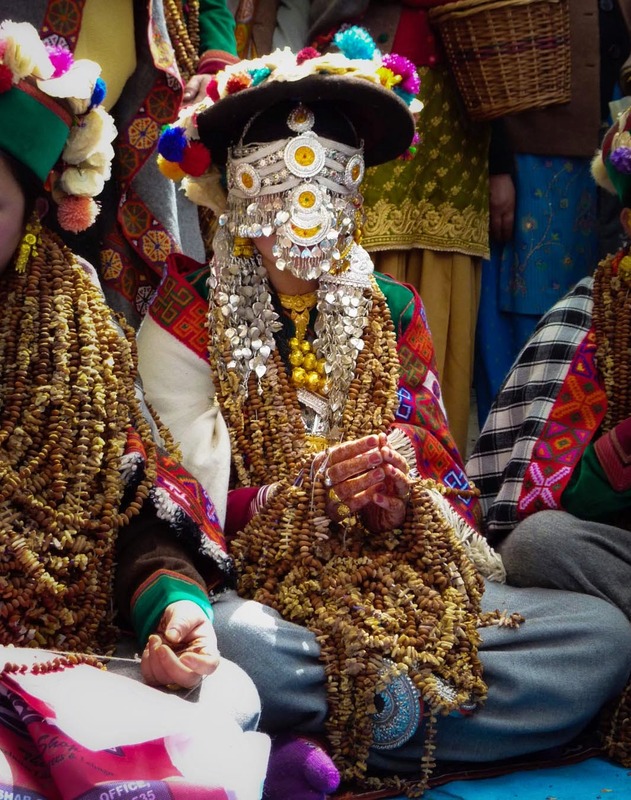 The predominant physical type of upper Kinnaur is the Mongoloid though a few persons with Mediterranean features are also seen in the area around Poo. 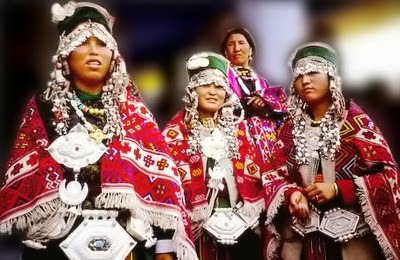 Some persons show the blending of Mediterrean and Mongoloid elements in varying degrees. 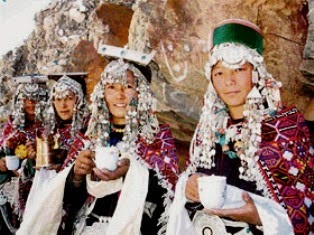 However the people of Hangrang valley are almost universally Mongoloids. 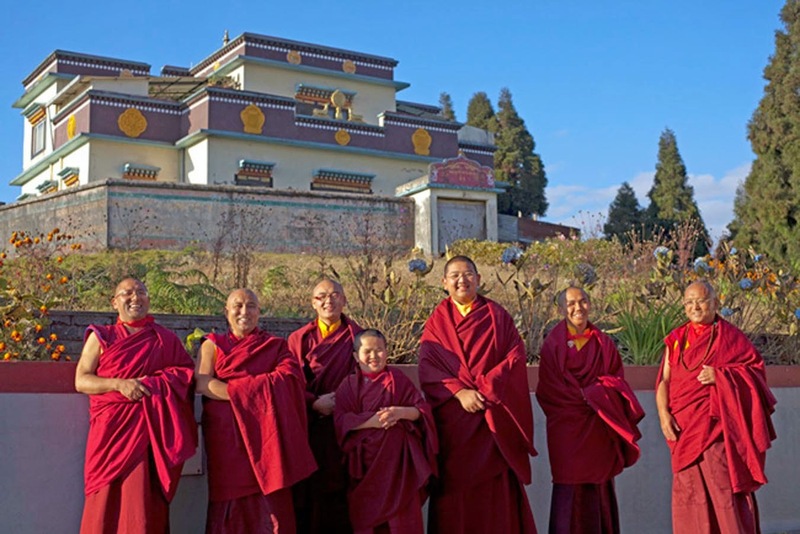 They mostly follow Mahayana Buddhist religion. 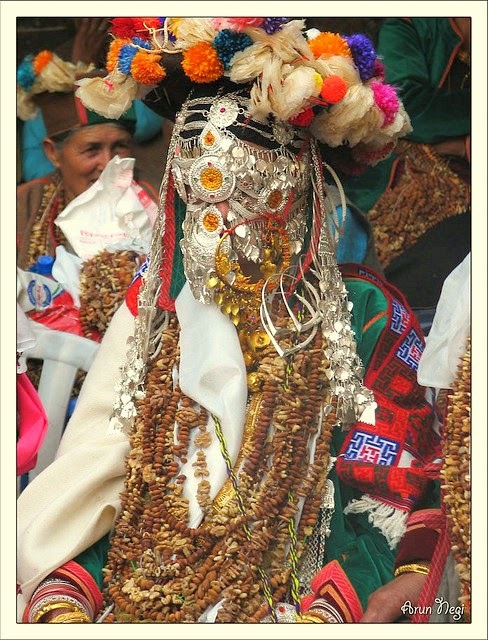 The Kannaurs are very fond of music, dance and singing. 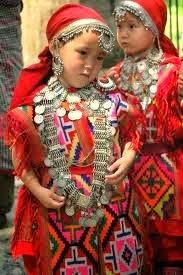 The Kinnaur society is divided into two broad occupational groups- peasants and the artisans possibly of diverse ethnic origin. These groups are represented by Gujjars and Kanet Rajputs and Schedule Castes. 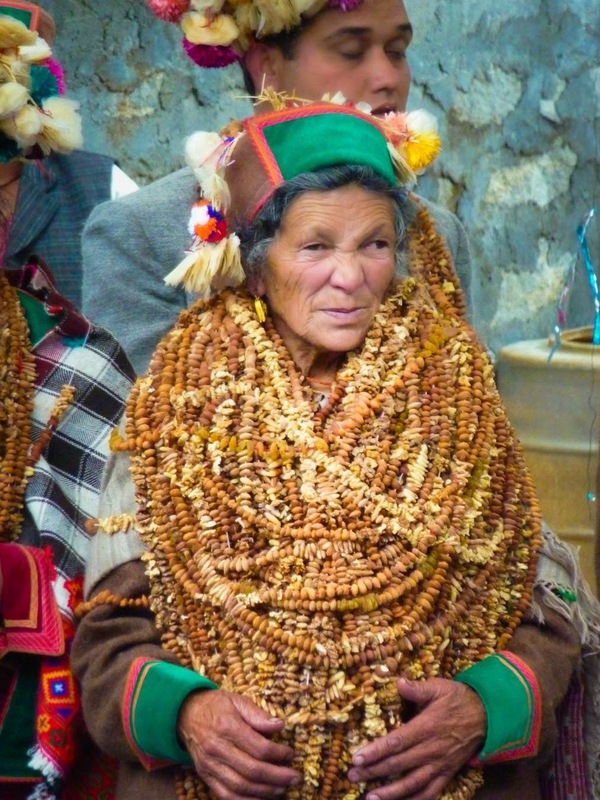 The Kanets comprise the main cultivating community of the area and use honorific surname Negi. 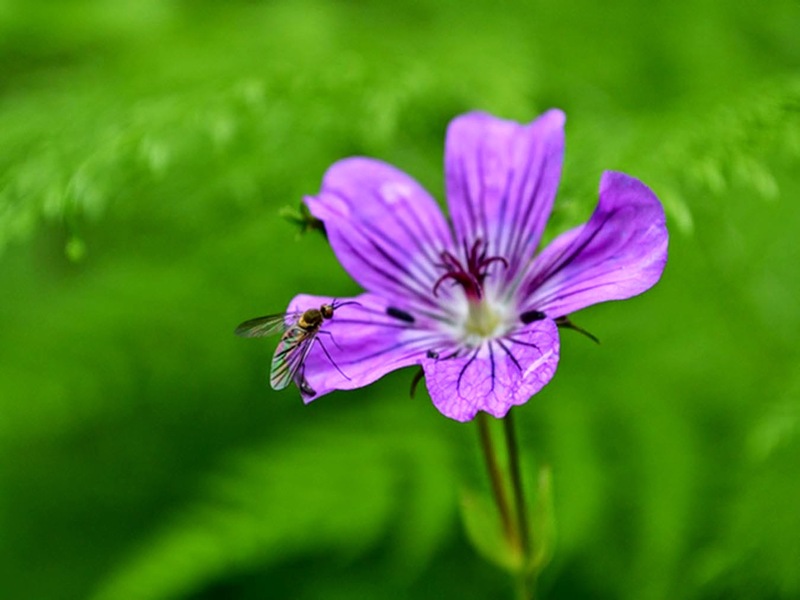 Among the Kanets there are three grades. 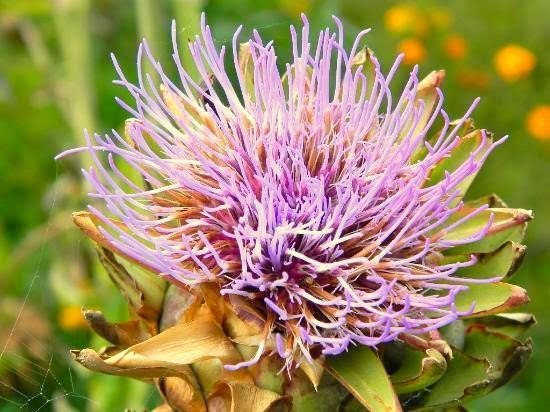 In the first grade Kanets there are as many as fifty sub-castes, in the second grades there are seventeen sub-castes and in the third grade who work as potter have three sub-castes. 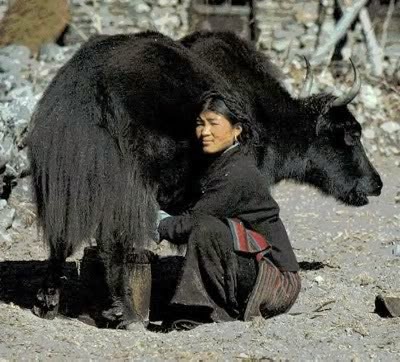 Waza Kanets belong to the third grade and are considered inferior among Kanets. There are two Scheduled caste groups based on the occupation. One group traditionally make and wove clothes whereas the others are primarily blacksmiths. 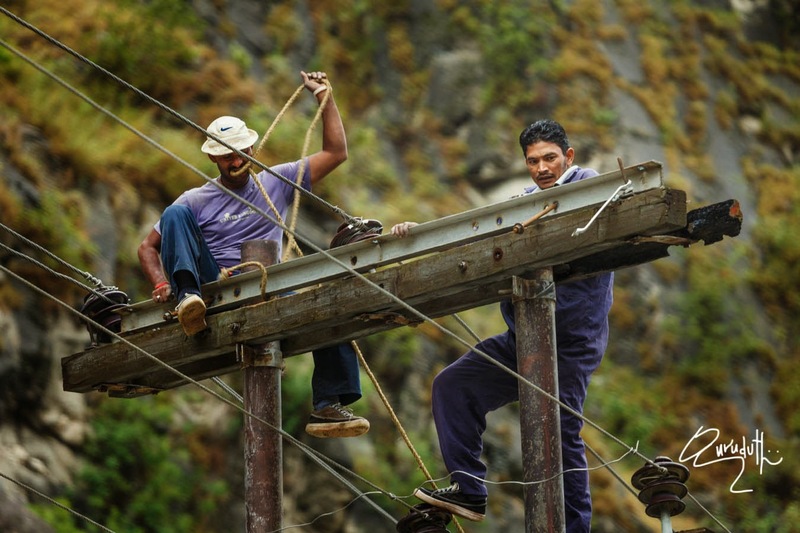 There is a third caste called who are carpenters. The main profession of Ores is carpentry. In social status the Ores are equal to blacksmiths. Among the scheduled castes blacksmiths and carpenters considered themselves superior to Weavers. 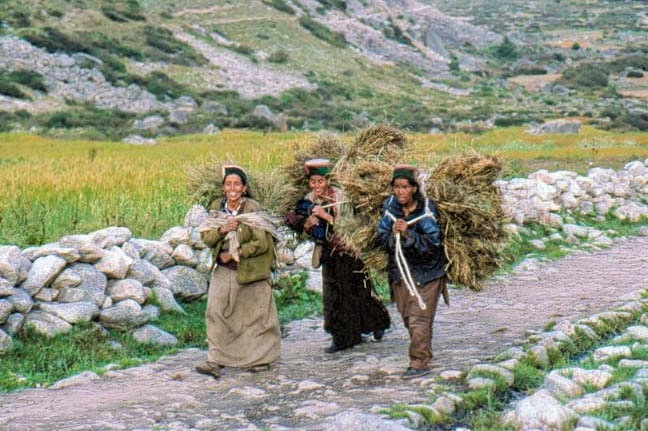 Both regional as well as social difference have influence on the linguistic climate of the region. A typical village is a mixture of Rajput, Blacksmiths and Carpenters, and all three speaks separate languages. The regional difference in language is spectacular - out of the total nine languages spoken in the district, six are regional differences and two are social varieties. Seven out of nine languages belong to Tobeto-Burman language family whereas the two caste languages belong to Indo-Aryan language family. All of these languages are predominantly used in the communication at home. It is quite common to hear the people speaking in their own language even In Reckong Peo, the district headquarters. 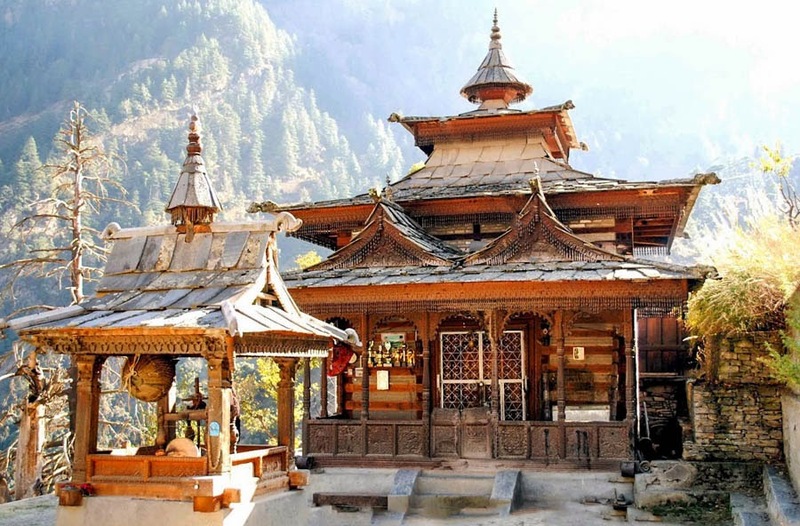 Buildings in Kalpa show strong Hindu and Buddhist influence. 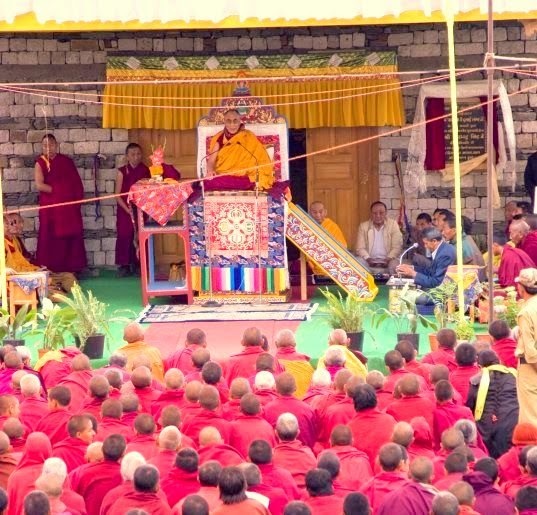 Buddhism is the main religions in the district followed by Tibetan Buddhism, Bon is not practiced but some are mistakenly or bought by money. 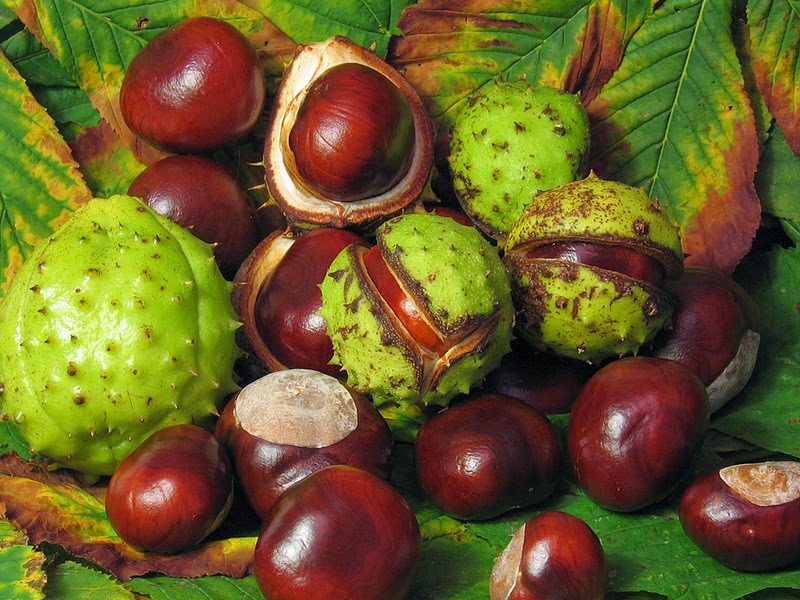 These three religions have undergone religious mixing, along with some indigenous shamanistic practices. 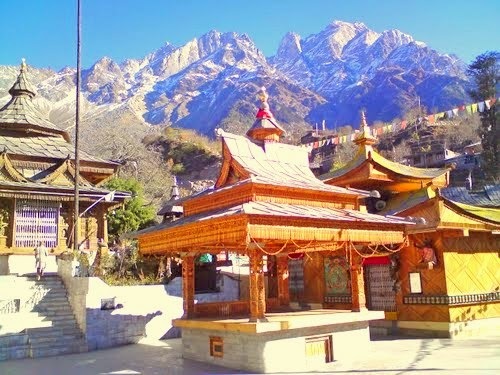 One can see some Buddhist influences on the Hindu religion in Lower Kinnaur, the mixing of Buddhist and Hindu beliefs in varying degrees in Middle Kinnaur, and even the influence of Hinduism on Buddhism in Pooh of Upper Kinnaur. 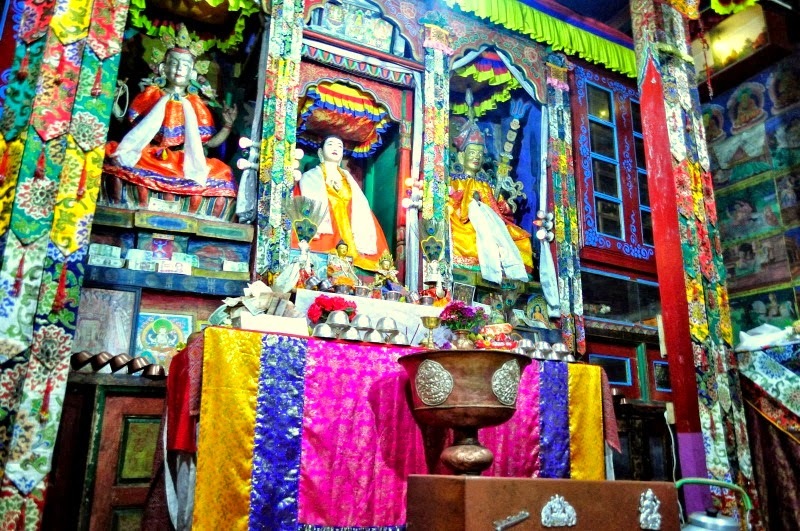 However, Buddhist Hangrang remains largely untouched by Hindu influence. 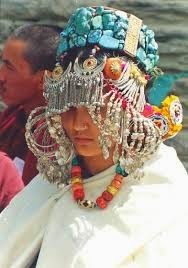 The Kinner Kailash is the most sacred mountain for most Kinners. 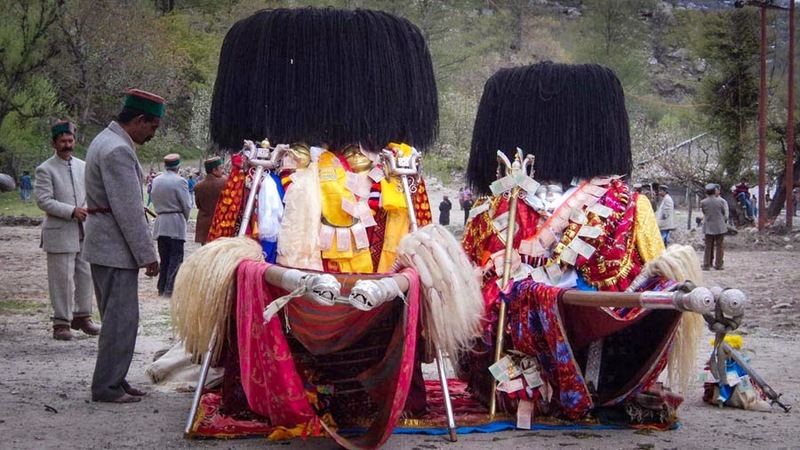 Every year it is visited by thousands of locals on religious pilgrimages known as Yatra, Hindu and Buddhist alike. 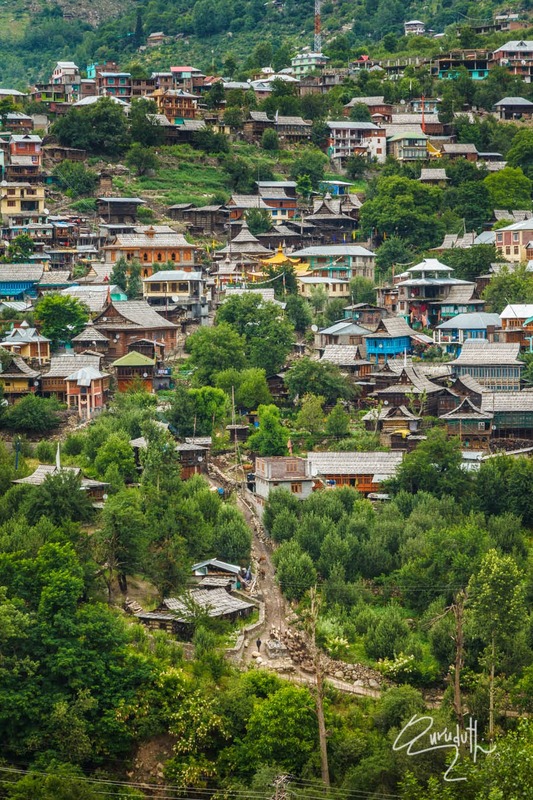 Portions of Kinnaur are situated high in the Himalaya, where vegetation is sparse and consists primarily of hardy grasses. 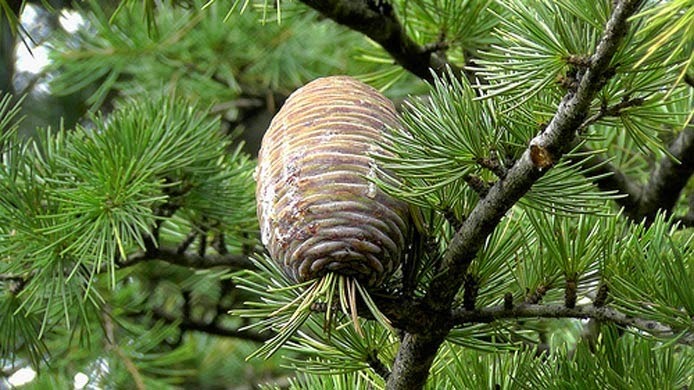 Alpine species such as Juniper, Pine, Fir, Cypress and Rhododendron can be found at elevations between 3,500 and 5,000 metres, primarily in Middle Kinnaur. 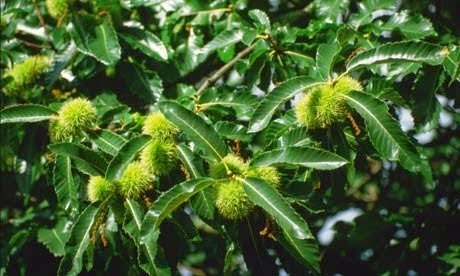 At lower altitudes, temperate-climate trees are found, including Oak, Chestnut, Maple, Birch, Alder, Magnolia, Apple and Apricot. 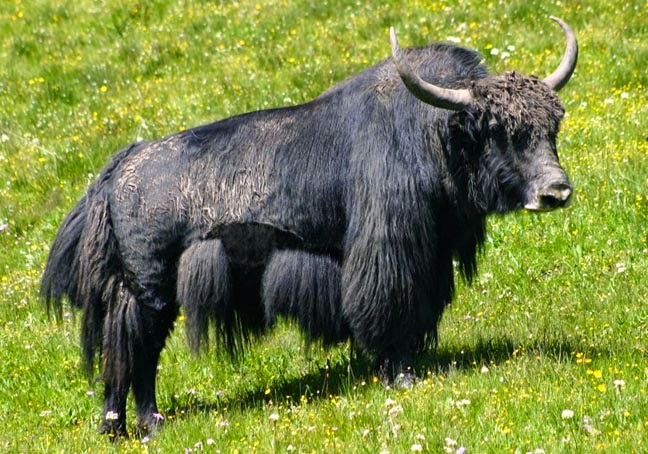 Yaks and Dzos are reared by local farmers in the higher areas. 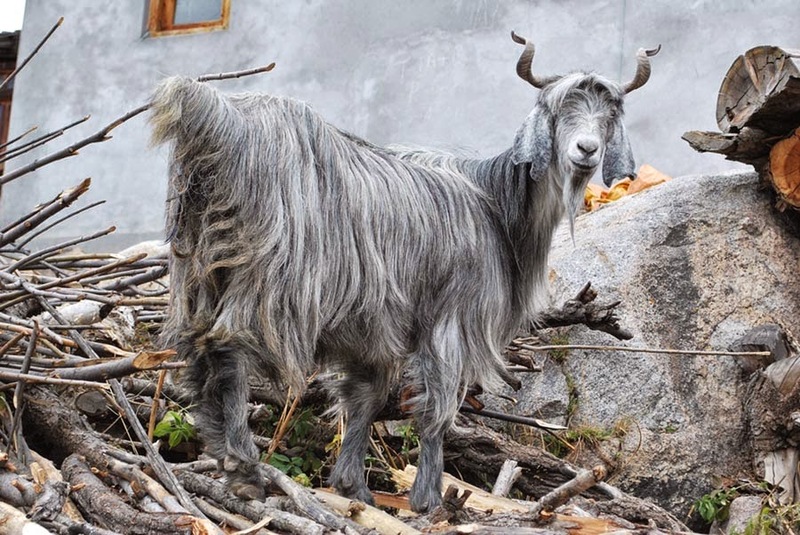 Scattered populations of the Himalayan Black Bears and small Ponies may also be found. 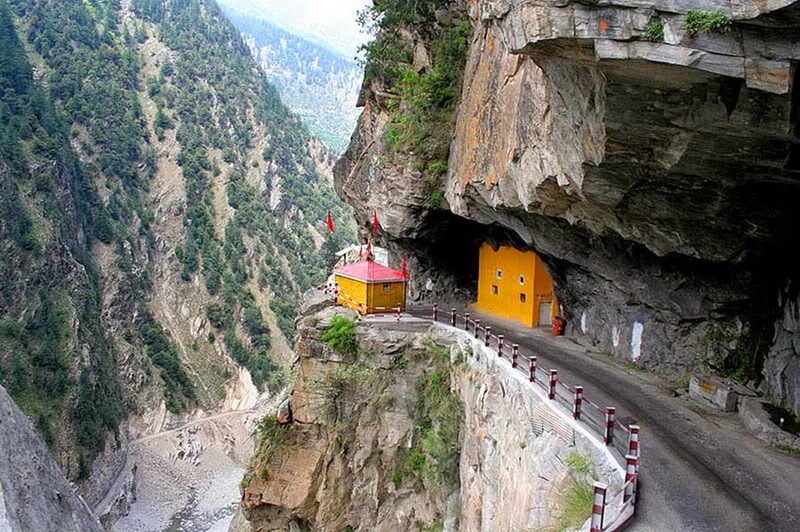 About 10 KMs from Kalpa, you can find the nearest petrol pump at Reckong Peo. There is one more fuel pump at Powari which is on Hindustan-Tibet Highway. Most of the time the fuel pump at Powari was not functional. On NH-22 at Tapri highway itself there is one fuel pump which is fairly new. 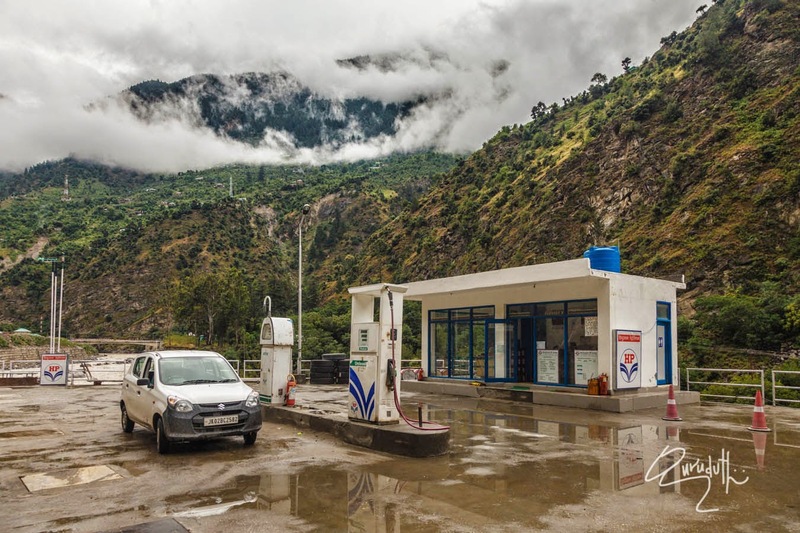 Best thing is to top up your fuel tank at Narkanda which is fair in terms of quality as well OR the last petrol pump in Rampur that comes on the right side while going from Shimla side. Day(3):-- 18th July 2014:---Today’s from Bhavnagar village, on our further onward journey, we would be travelling on the rough portion of NH-22. 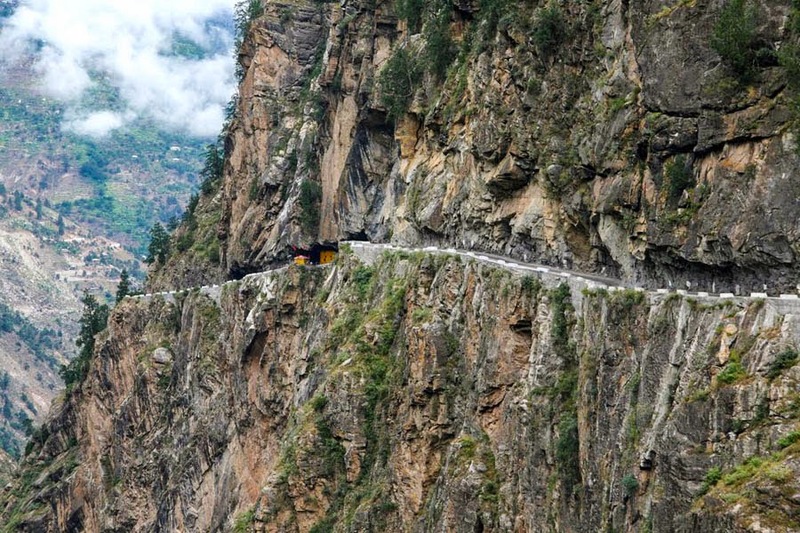 From here onwards we would be climbing upwards throughout the most deplorable snake like winding road of Wangtoo, Tapri, Chaling, Karcham and finally Sangla. 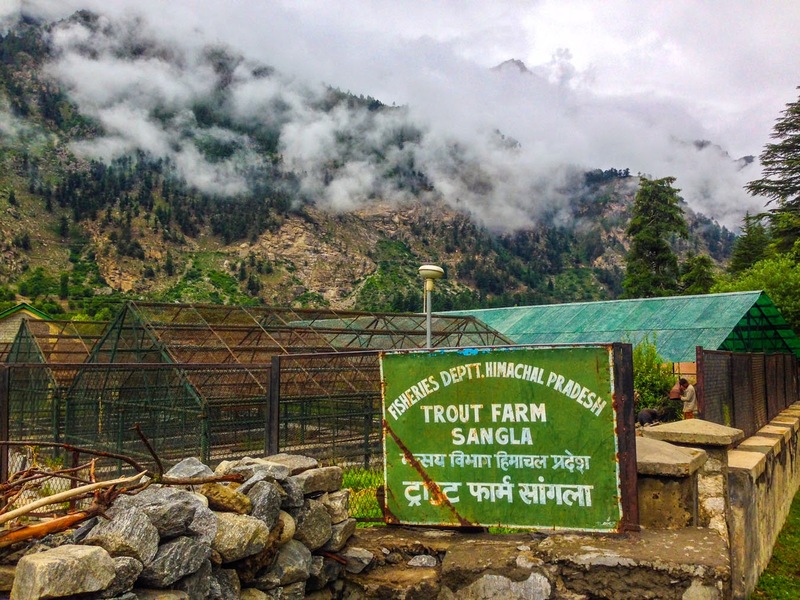 Our today’s night stay would be at Sangla village. 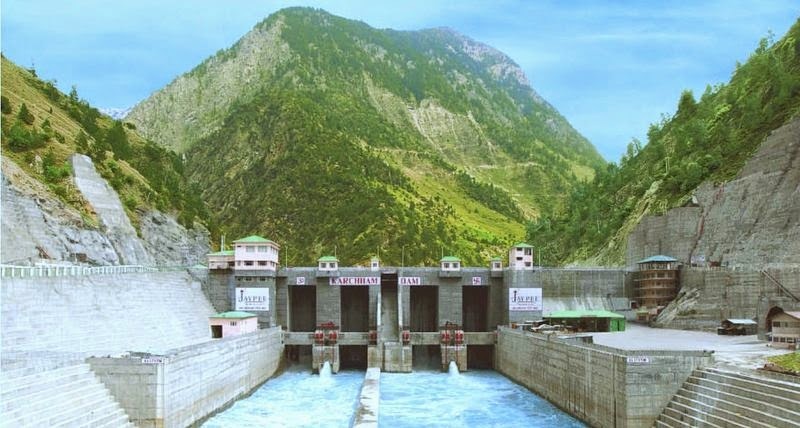 At “Wangtoo” - The Karcham Wangtoo Hydroelectric Plant is a 1,000 megawatts (1,300,000 hp) on the Sutlej river in Kinnaur district. The dam and power station are located between the villages of Karcham and Wangtoo, where the plant also gains its name. Jaypee Karcham Hydro Corporation Limited. The construction on the power station began on 18 November 2005.The first generator was commissioned in May 2011, the second in June and the final two in September 2011. 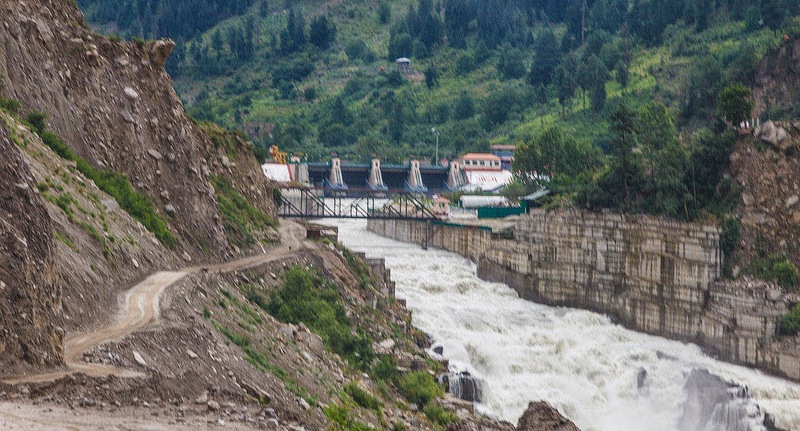 The (322 ft) tall dam at Karcham diverts a substantial portion of the Sutlej into a 10.48 m (34.4 ft) diameter and 17.2 km long headrace tunnel to the underground power station downstream at Wangtoo. 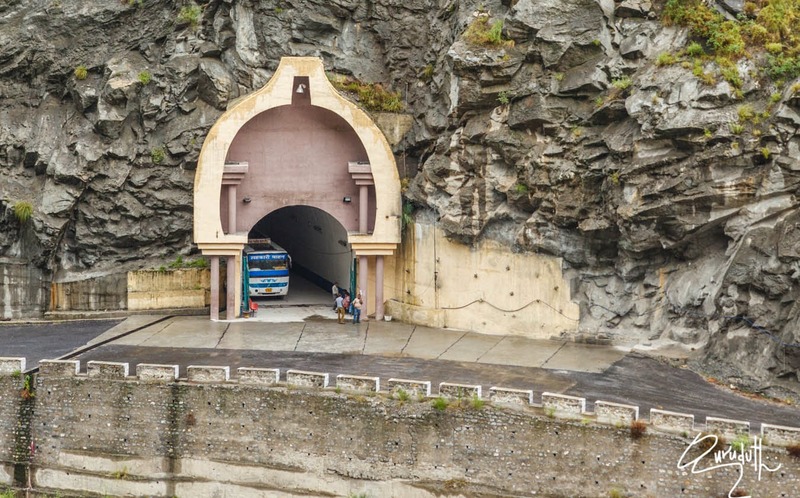 At the station, the water powers four 250 MW generators before it is sent back into the Sutlej via a 1.2 km long tailrace tunnel. Water not diverted by the dam is sent over the Spillway and down the normal course of the river. The main spillway is along the crest of the dam and is controlled by six redial gates. Just upstream of the dam is the 300 MW Baspa II Hydroelectric Plant and downstream of the Karcham Wangtoo is the 1,500 MW Nathpa Jhakri Dam. At “Tapri”:--- Here we filled our car’s Petrol tank to full capacity. In between Tapri village and Chaling village, NH-22 was blocked due to heavy Landslides. These two villages are just 4 Km away from each other. But to avoid 4kms of Landslide area, all vehicle drivers had to take 25 Km detour road through Urni village, which has very steep gradient and is very narrow with only mud road which are full of potholes. From Tapri side, first we had to climb up for about 15 Km to reach Urni village and then drive down the steep slops for another 10 km to come and join at Chaling. Since only one way heavy vehicles traffic was allowed, but still we took nearly more than one hour just to cover 25 Km. One way traffic was controlled by Police as well as BRO staff. 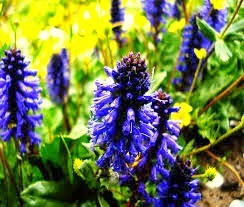 Urni village is situated at an altitude of (4,760 ft) above MSL. 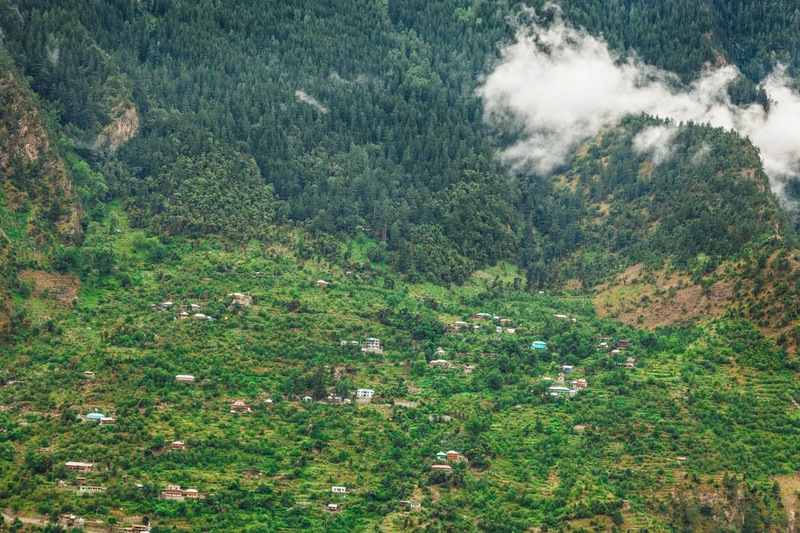 Urni though is a very small village, but mind you it has mind boggling landscapes, scenic beauty and awesome natural surroundings which are so soothing to eyes that it feels blissful. 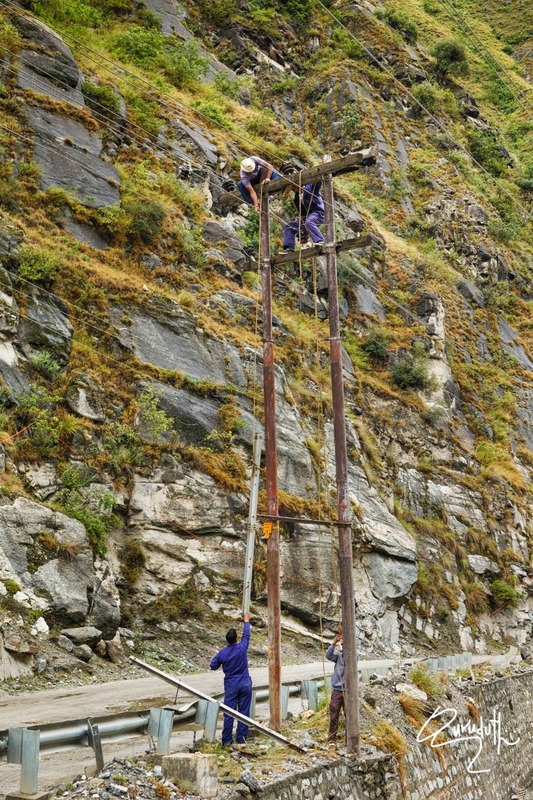 In Himachal Pradesh, Urni is one of the most devastatingly worst effected landslide areas. After “Chaling”, “karcham” is 4 Kms away. 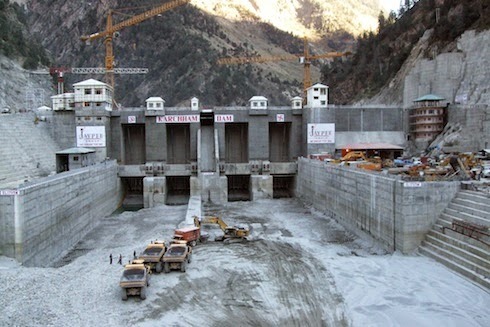 “Karcham” holds a Hydro Electric Dam by Jeypee Indusries which produces 500 MW of power. 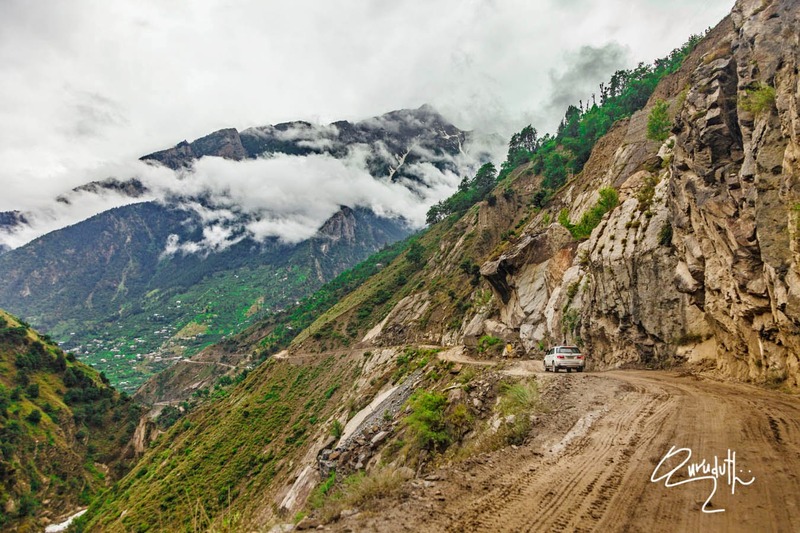 To go to Sangla Valley or also known as the “(Baspa Valley)”, we had to take a diversion towards right side of the road from Karcham which is at “Hindustan Tibet Highway” that goes further onwards towards “Kaza” from Shimla. 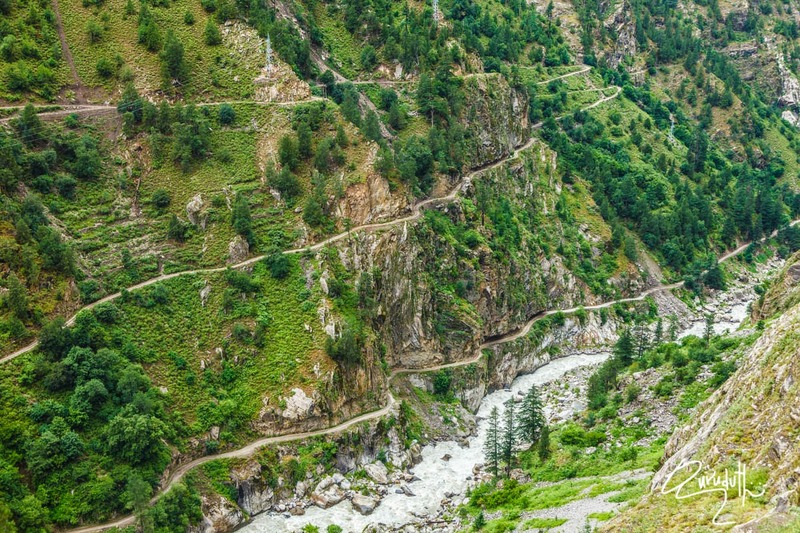 The distance from Karcham to sangla is about 16 Km. 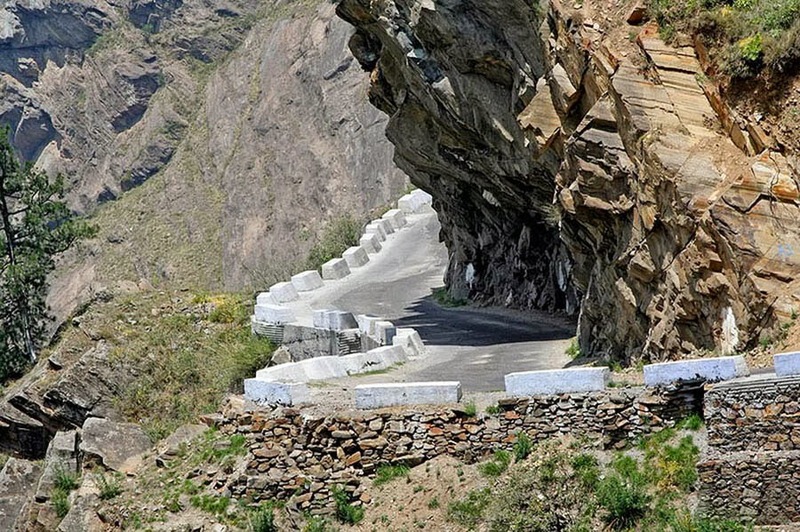 It’s very steep climb and the road though is moderately good, but is very narrow and is full of blind curves and bends where we see nothing beyond the curves. For the first time drives like me, it’s very dangerous drive and we had to drive very carefully and slowly. 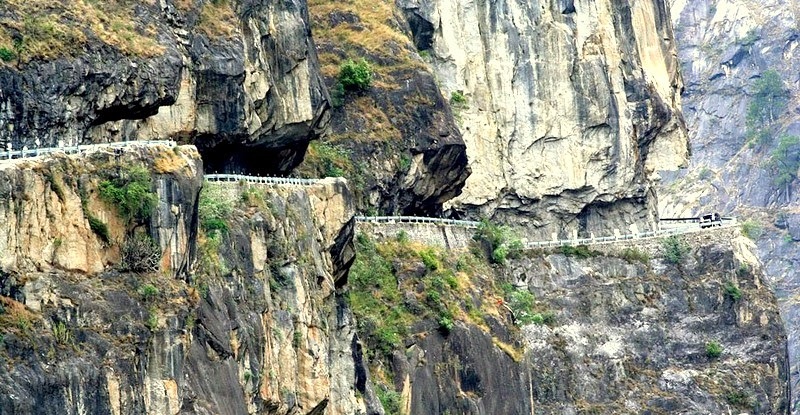 One mistake and we would be tumbling down through deep gorges and would be plunged deep into furiously flowing river Baspa. Later they would have had to pull out badly mangled car and our carcasses only. Important :--- Please you must go through this Video Link. 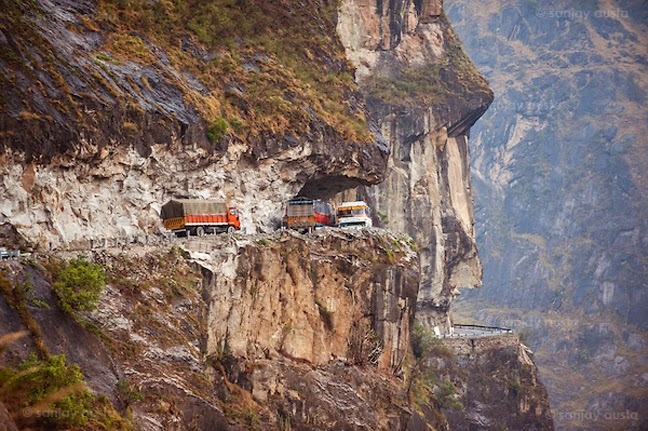 This shows that how dangerous road it is that Guruduth and I,travelled through. "This road is called as THE "ROAD TO HELL"
in case if this link does not work please copy the Link and paste in different window. Finally at about 3 PM we reached Sangla town. Since we were dead tired and very hungry, the very first thing that we did was that we straight went in to one road side small eating joint and had hot Muttter-Paneer, Daal, Chawal for lunch. Then we started, room hunting for our night stay. The PWD guest house was full and then finally we managed to take a room for the night stay at a nearby hotel named as “Ashiana Guest House”. First the manager of the hotel at the counter told he would be charging Rs. 700/- per night. Since it was a rainy season that means it was off season, after lot of coaxing and bargain, somehow we managed him to agree for Rs. Rs. 400/- Once we settled down in our hotel room, it started raining heavily and continued raining whole night through. In the same evening itself, in the rain itself we drove down across the river Baspa to visit “Trout Fish Farm”, which is on the other side of river Baspa. 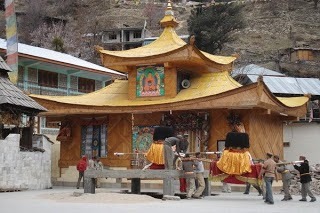 And once we came back from “Trout Fish Farm”, we went to visit "Snake-Temple" called as Bering Nag Temple. Just adjacent to the temple, there is a "Buddhist Monastery" too. 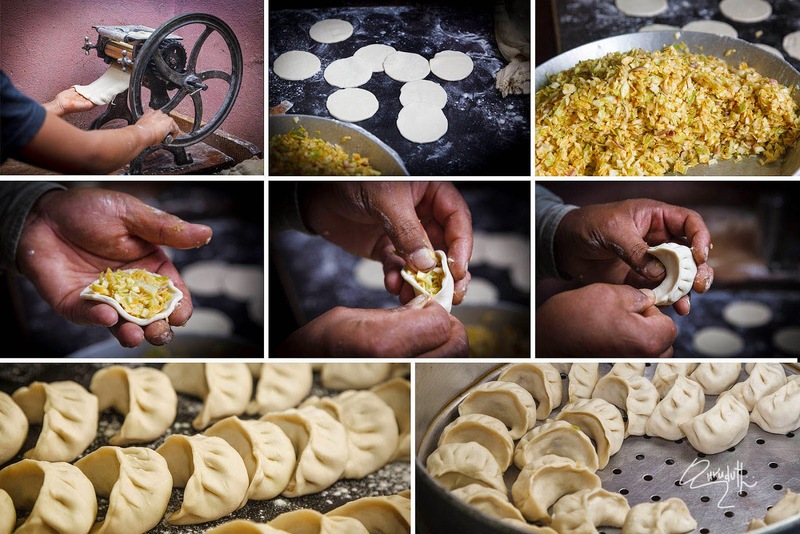 In the night we had dinner at a Tibetan Cafe and had hot soup, moomos and Chowmein. Since we realized that wherever and wherever we take hotel rooms for our night stays. 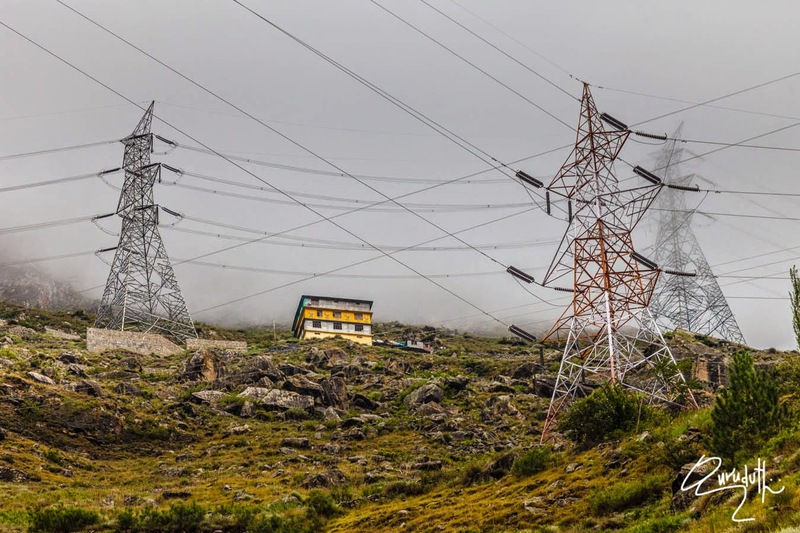 There wouldn’t be more than one or two electrical plug-points in any rooms, where we could plug in for charging, our electrical Gadgets, like our Mobile Phone hand-sets; half a dozen batteries of Gurudatt’s and my cameras etc. 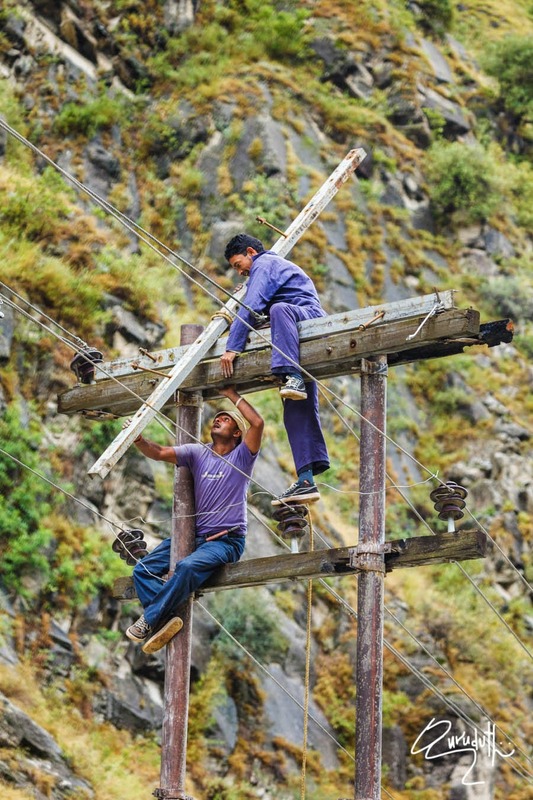 So, just to avoid this major problem, at Sangla itself, from one of the electrical shop, we bought on electrical extension cable connector, which had 5 plug- points. It was so convenient that throughout our further onwards journey, without any hassle we could simultaneously changer all most all our required electrical Gadgets. 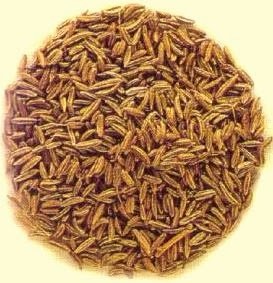 At Sangla agricultural department of Himachal Pradesh has started growing and cultivating Saffron and Jeera (spice), also called as Cumin. 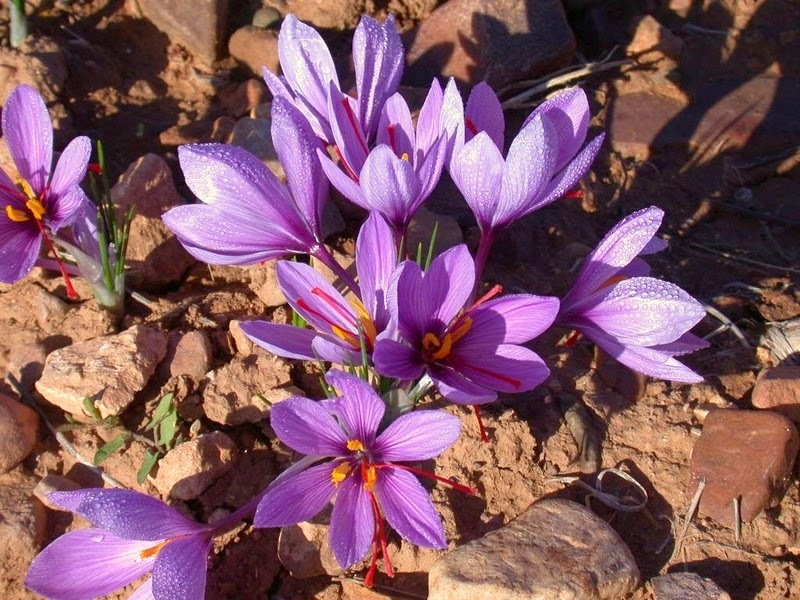 Though the quality of saffron grown here is not good compare to Kashmir Saffron. 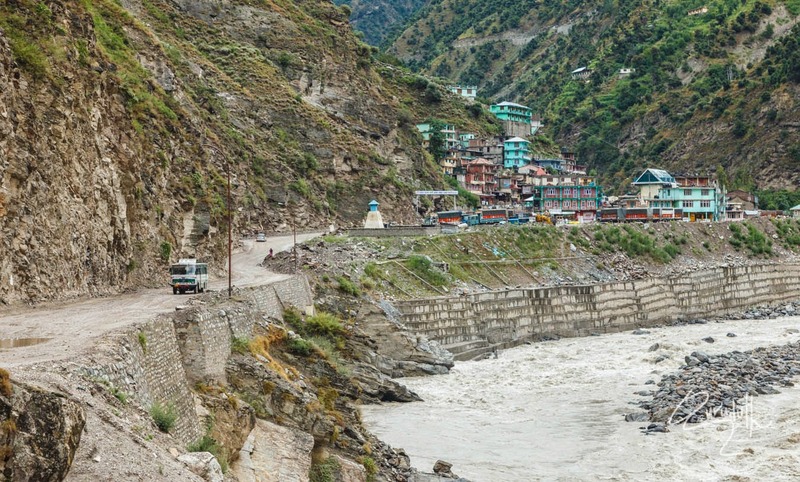 The river Baspa which flows through sangla is rich with Trout and Mahsheer fish. 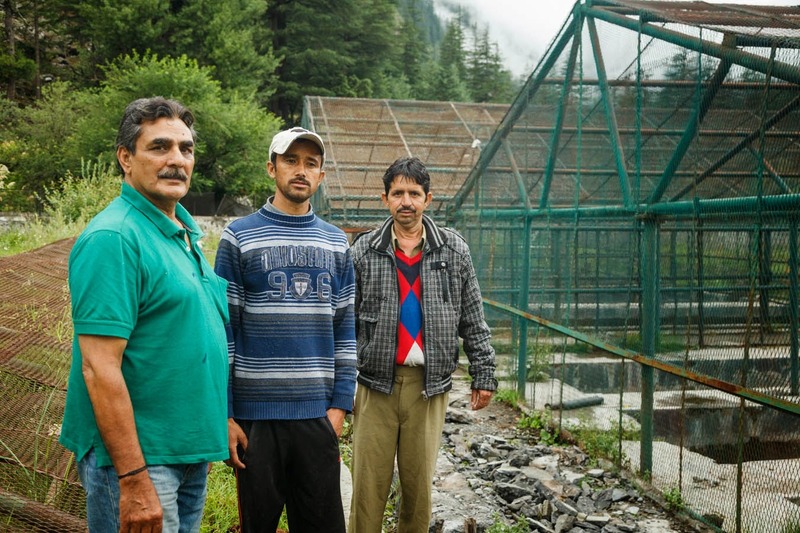 Across the Sangala town on the other side of River Baspa, Himachal Fishery department has an establish a Trout Fish farming, which they supply to other small time Trout fish entrepreneurs. 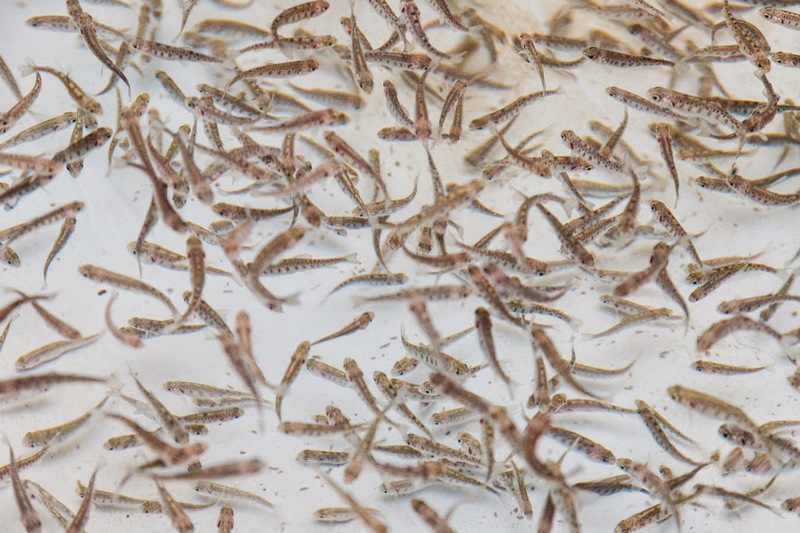 Important factor of rearing Trout fish is that the temperature of water should remain always less that 15 degrees centigrade. Otherwise Trout fish would die. 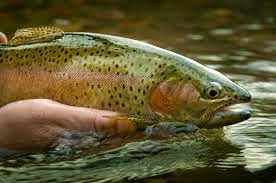 Since it is very difficult to rear Trout, so it is very expensive fish and cost almost Rs,500/- per Kg. We can reach this Trout Fish farm either on foot, covering 3 Km or we can drive through the Hydral Project and reach by road covering 6 Km. But mind you the road is very narrow and is throughout a mud road, which is full of slush and potholes. It’s very risky to drive here and this mud road does not go right upto the “Trout Fish Farm”. We have to park our vehicles at the Nalla crossing (across which there are still the remains of a badly damaged concrete RCC bridge) and then we have to walk about one Km through beautiful groves of Pine and Deovdar (Ceder trees) forest . The Blissful Splendor in Soothing isolation. 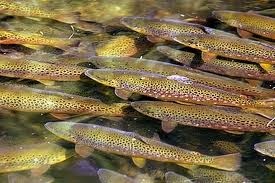 Mind you it’s an awesome experience to see the scientific process of breeding and rearing new spawned baby Trout fish. 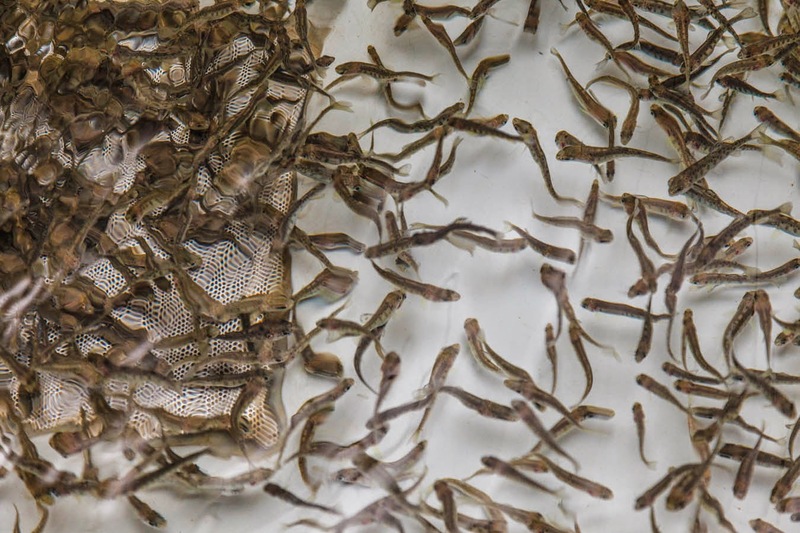 At the Trout Fish Farm there are always technical staffs who would explain scientifically the whole process of rearing Trout fish from Baby to full grown size. 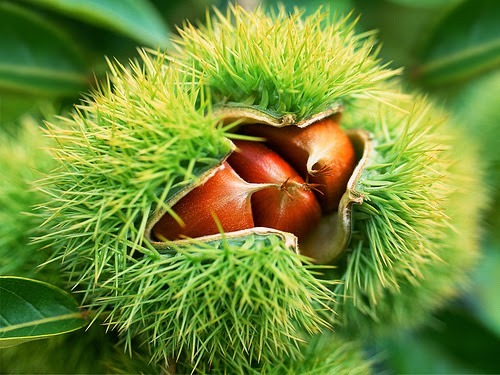 It is an awesome experience to know all about this. 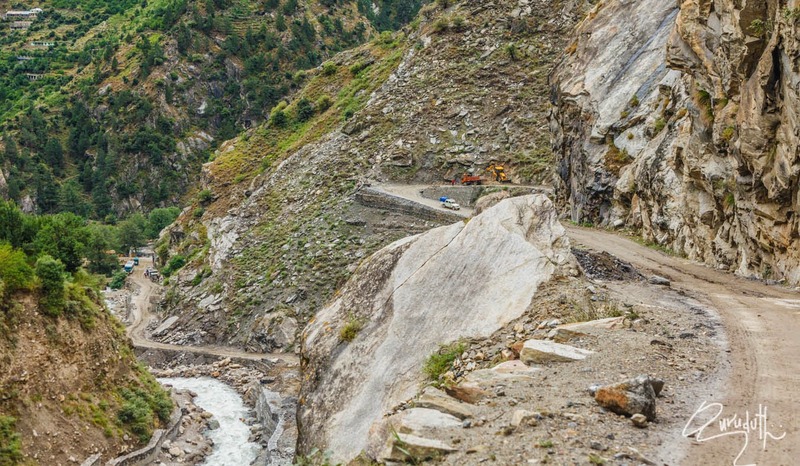 Nestling inbetween two mighty mountain ranges, Sangla is one of the most picturesque glaciated valley of Kinnaur. 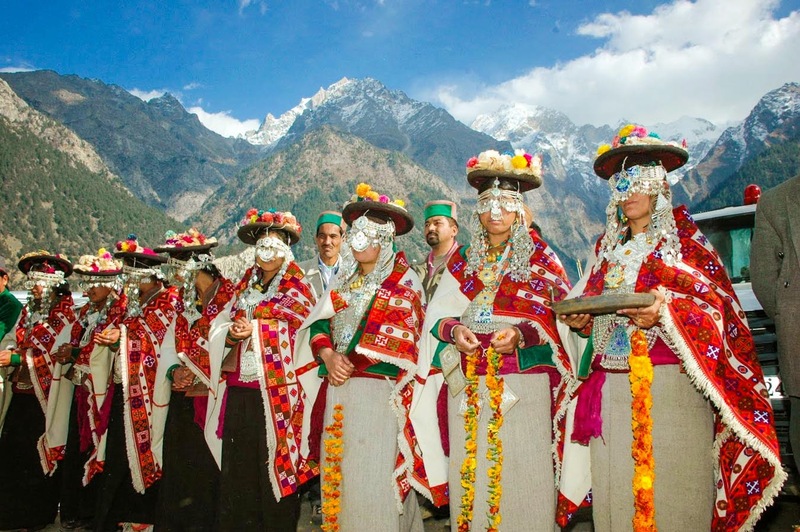 Valley is a part of Kinnaur and is inhibited by Kinnauris. A part of the population also depends on tourism. The valley remains closed for six months during winter (from December till May) when the snowfall is heavy. 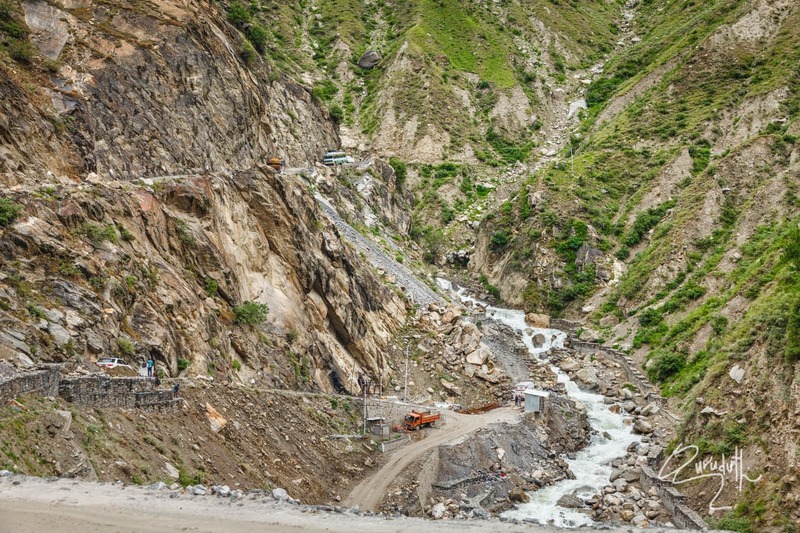 The old Indo-Tibet road connects Sangla to The National Highway 22 at Karcham. Mind Boggling view of the Sangla village from Across "BASPA RIVER"
Sangla is the major town in the valley having petrol pump, Bank ATMs, Post Office, Restaurants, Hospital, Liquor Bar, mid range hotels and shops. 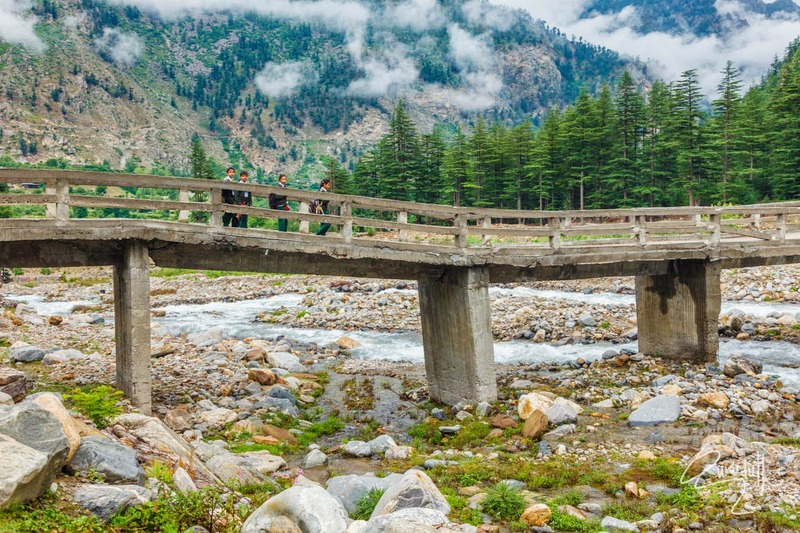 The valley is surrounded by lush green forests, green meadows, snow clad mountains as well as the other beautiful landscapes. 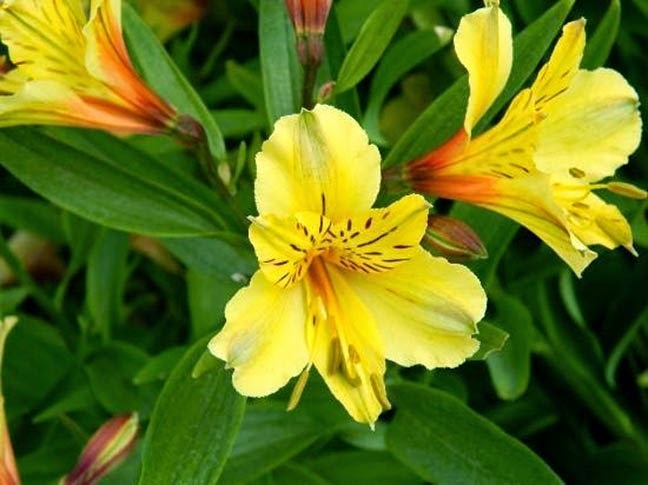 It's location is in the greater Himalayan ranges that gives it a milder climate than the plains. 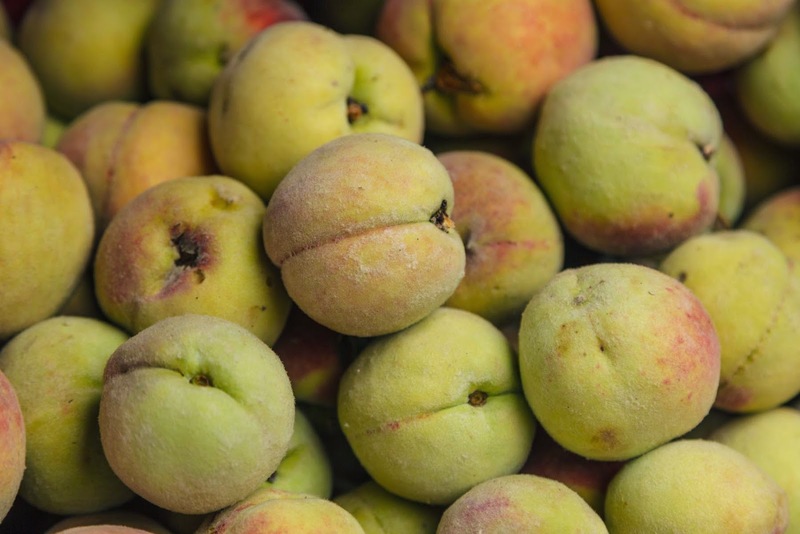 The Baspa River flows in the Sangla Valley which enriches in apple orchards, apricot, Wall-nut, Cedar trees, and glacial streams with trout. 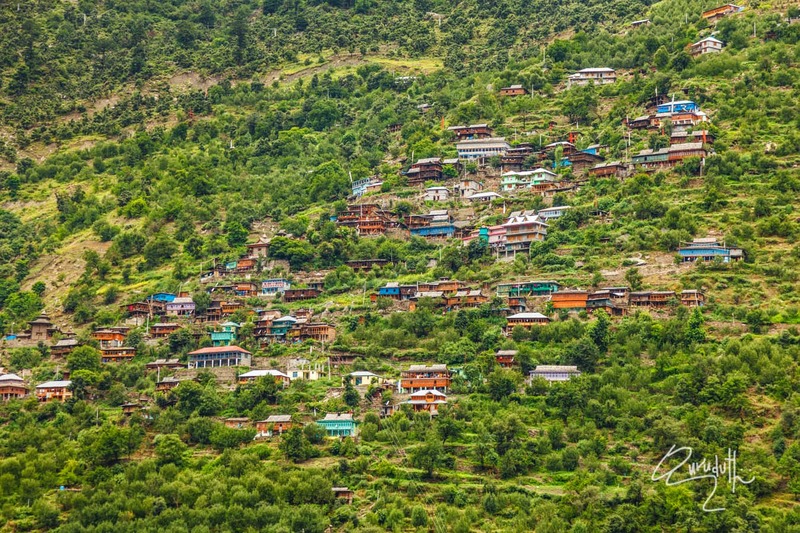 The main villages in the valley, include Chitkul, Rakcham, Batseri, Themgarang, Kamru, and Sapni. 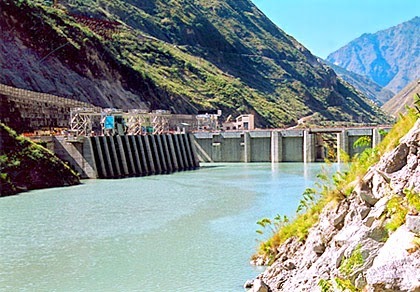 The nearby Baspa Hydel-Project has been completed in 2009. 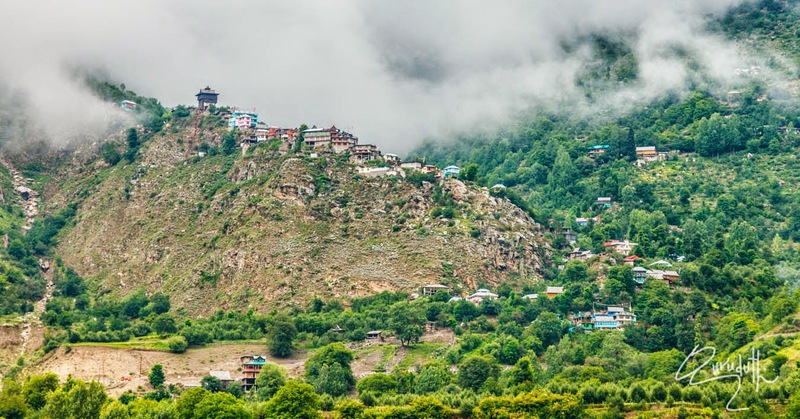 Besides the natural beauty of Great Himalaya Kamru Fort, Mata Devi Temple & Baring Nag Temples, Biddhist Monastery are the main attractions of the Valley.